본 발명은 박막 증착 장치에 관한 것으로, 상세하게는 대형 기판 양산 공정에 용이하게 적용될 수 있고, 제조 수율이 향상된 박막 증착 장치에 관한 것이다. The present invention relates to a film deposition apparatus, and more particularly can be readily applied to large-sized board production process, the present invention relates to a manufacturing yield is improved film deposition apparatus. 본 발명은 기판상에 박막을 형성하기 위한 박막 증착 장치에 있어서, 증착 물질을 방사하는 증착원; The present invention relates to a film deposition apparatus for forming a thin film on a substrate, an evaporation source for emitting a deposition material; 상기 증착원의 일 측에 배치되며, 제1 방향을 따라 복수 개의 증착원 노즐들이 형성되는 증착원 노즐부; Deposition source nozzle unit that is disposed on one side of the evaporation source, a plurality of deposition source nozzles are formed along a first direction; 및 상기 증착원 노즐부와 대향되게 배치되고, 상기 제1 방향에 대해 수직인 제2 방향을 따라 복수 개의 패터닝 슬릿들이 형성되는 패터닝 슬릿 시트를 포함하고, 상기 기판이 상기 박막 증착 장치에 대하여 상기 제1 방향을 따라 이동하면서 증착이 수행되고, 상기 증착원, 상기 증착원 노즐부 및 상기 패터닝 슬릿 시트는 일체로 형성되는 것을 특징으로 하는 박막 증착 장치를 제공한다. And wherein with respect to including the patterning slit sheet in which a plurality of patterning slits are formed, and the substrate on which the film deposition apparatus in accordance with the vertical in a second direction with respect to the first direction and disposed opposite to the deposition source nozzle unit, deposition is performed while moving along a first direction and, the evaporation source, the deposition source nozzle unit and the patterning slit sheet provides a film deposition apparatus, characterized in that integrally formed. 일반적으로, 유기 발광 디스플레이 장치는 애노드와 캐소드에서 주입되는 정공과 전자가 발광층에서 재결합하여 발광하는 원리로 색상을 구현할 수 있도록, 애노드와 캐소드 사이에 발광층을 삽입한 적층형 구조를 가지고 있다. In general, an organic light emitting display device so that the holes and the electrons injected from the anode and the cathode to implement a color on the principle that light emission by the recombination in the light emitting layer, and has a stacked structure in which a light-emitting layer inserted between the anode and the cathode. 그러나, 이러한 구조로는 고효율 발광을 얻기 어렵기 때문에, 각각의 전극과 발광층 사이에 전자 주입층, 전자 수송층, 정공 수송층 및 정공 주입층 등의 중간층을 선택적으로 추가 삽입하여 사용하고 있다. However, such a structure has been used by the optional addition of inserting an intermediate layer, such as it is difficult to obtain a high-efficiency light emission, and each of the electron injection layer between the electrode and the light emitting layer, an electron transport layer, a hole transport layer and hole injection layer. 그러나, 발광층 및 중간층 등의 유기 박막의 미세 패턴을 형성하는 것이 실질적으로 매우 어렵고, 상기 층에 따라 적색, 녹색 및 청색의 발광 효율이 달라지기 때문에, 종래의 박막 증착 장치로는 대면적(5G 이상의 마더 글래스(mother-glass))에 대한 패터닝이 불가능하여 만족할 만한 수준의 구동 전압, 전류 밀도, 휘도, 색순도, 발광 효율 및 수명 등을 가지는 대형 유기 발광 디스플레이 장치를 제조할 수 없는 바, 이의 개선이 시급하다. However, to form a fine pattern of an organic thin film such as a light emitting layer and the intermediate layer becomes substantially difficult, the emission efficiency of the red, green, and blue varies according to the layer, in the conventional film deposition apparatus is a large area (more than 5G mother glass (mother-glass)) patterning is not possible to a satisfactory level of the driving voltage, current density, brightness, color purity, the bar can not be made large organic light-emitting display device having a light-emitting efficiency and life of the, improvement thereof it is urgent. 한편, 유기 발광 디스플레이 장치는 서로 대향된 제1 전극 및 제2 전극 사이에 발광층 및 이를 포함하는 중간층을 구비한다. On the other hand, the organic light-emitting display device is provided with an intermediate layer including a light emitting layer, and this between the first and second electrodes opposed to each other. 이때 상기 전극들 및 중간층은 여러 방법으로 형성될 수 있는데, 그 중 한 방법이 증착이다. At this time, the electrodes and the intermediate layer may be formed in many ways, it is one way of which is deposited. 증착 방법을 이용하여 유기 발광 디스플레이 장치를 제작하기 위해서는, 박막 등이 형성될 기판 면에, 형성될 박막 등의 패턴과 동일한 패턴을 가지는 파인 메탈 마스크(fine metal mask: FMM)를 밀착시키고 박막 등의 재료를 증착하여 소정 패턴의 박막을 형성한다. In order to manufacture an organic light emitting display device using a deposition process, the substrate surface is a thin film, etc. is formed, fine metal mask having the same pattern as the pattern of the thin film and so on to be formed: contact the (fine metal mask FMM) and a thin film including by depositing a material to form a thin film of a predetermined pattern. 본 발명은 제조가 용이하고, 대형 기판 양산 공정에 용이하게 적용될 수 있으며, 제조 수율 및 증착 효율이 향상된 박막 증착 장치를 제공하는 것을 목적으로 한다. An object of the present invention is to manufacture is easy, and can be readily applied to a large substrate production process, providing a manufacturing yield and deposition efficiency are improved film deposition apparatus. 본 발명에 있어서, 상기 증착원 및 상기 증착원 노즐부와 상기 패터닝 슬릿 시트는 연결 부재에 의해 결합되어 일체로 형성될 수 있다. In the present invention, the deposition source and the deposition source nozzle unit and the patterning slit sheet it may be integrally formed are coupled by a connecting member. 여기서, 상기 연결 부재는 상기 증착 물질의 이동 경로를 가이드 할 수 있다. Here, the connection member may guide the movement path of the deposition material. 여기서, 상기 연결 부재는 상기 증착원 및 상기 증착원 노즐부와 상기 패터닝 슬릿 시트 사이의 공간을 외부로부터 밀폐하도록 형성될 수 있다. Here, the connection member may be formed to seal a space between the evaporation source and the deposition source nozzle unit and the patterning slit sheet from the outside. 본 발명에 있어서, 상기 박막 증착 장치는 상기 기판과 소정 정도 이격되도록 형성될 수 있다. In the present invention, the thin film deposition apparatus may be formed so as to be spaced apart from the substrate to the desired extent. 본 발명에 있어서, 상기 기판이 상기 박막 증착 장치에 대하여 상기 제1 방향을 따라 이동하면서, 상기 기판상에 상기 증착 물질이 연속적으로 증착될 수 있다. In the present invention, the substrate may be moving along the first direction, wherein the deposition material on the substrate continuously deposited on said film deposition apparatus. 본 발명에 있어서, 상기 박막 증착 장치의 상기 패터닝 슬릿 시트는 상기 기판보다 작게 형성될 수 있다. In the present invention, the patterning slit sheet of the thin film deposition apparatus may be formed to be smaller than the substrate. 본 발명에 있어서, 상기 증착원 노즐부와 상기 패터닝 슬릿 시트 사이에 배치되어 상기 증착원으로부터 방사되는 상기 증착 물질 중 적어도 일부를 차단하는 보정판을 더 포함할 수 있다. In the present invention, is disposed between the deposition source nozzle unit and the patterning slit sheet may further include a compensation plate for blocking at least a portion of the deposition material radiated from the evaporation source. 여기서, 상기 보정판은 증착되는 박막의 두께가 실질적으로 동일하게 형성되도록 구비될 수 있다. Here, the compensator may be provided so that the thickness of the thin film to be deposited substantially identically formed. 여기서, 상기 보정판은 상기 패터닝 슬릿 시트의 중심에서 멀어질수록 높이가 낮게 형성될 수 있다. Here, the compensation plate may be formed of a low height of the farther from the center of the patterning slit sheet. 여기서, 상기 보정판은 원호 또는 코사인 곡선의 형상으로 형성될 수 있다. Here, the compensation plate may be formed in the shape of a circular arc or a cosine curve. 여기서, 상기 보정판은 상기 패터닝 슬릿 시트의 중심에서의 상기 증착 물질의 차단량이 상기 패터닝 슬릿 시트의 단부에서의 상기 증착 물질의 차단량보다 많도록 형성될 수 있다. Here, the compensation plate may be formed to block the amount of the deposition material at the center of the patterning slit sheet greater than the blocked amount of the deposited material at the ends of the patterning slit sheet. 본 발명에 있어서, 상기 복수 개의 패터닝 슬릿들은 서로 상이한 길이를 갖도록 형성될 수 있다. In the present invention, the plurality of patterning slits may be formed so as to have mutually different lengths. 여기서, 상기 복수 개의 패터닝 슬릿들은 증착되는 박막의 두께가 실질적으로 동일하게 형성되도록 구비될 수 있다. Here, the plurality of patterning slits may be provided such that the thickness of the thin film to be deposited substantially identically formed. 여기서, 상기 각 패터닝 슬릿들의 길이에 의하여, 상기 기판상에 증착되는 증착 물질의 증착량이 제어될 수 있다. Here, by the length of each of the patterning slits, it can be controlled amount of deposition of the deposition material deposited on the substrate. 여기서, 상기 패터닝 슬릿 시트의 중심 부분의 상기 패터닝 슬릿의 길이가 상기 패터닝 슬릿 시트의 양단부의 상기 패터닝 슬릿의 길이보다 짧게 형성될 수 있다. Here, the length of the patterning slits in the center portion of the patterning slit sheet may be formed shorter than the length of the patterning slits in both end portions of the patterning slit sheet. 본 발명에 있어서, 상기 복수 개의 증착원 노즐들은 소정 각도 틸트 되도록 형성될 수 있다. In the present invention, the plurality of deposition source nozzles may be formed such that the predetermined tilt angle. 여기서, 상기 복수 개의 증착원 노즐들은 상기 제1 방향을 따라 형성된 두 열(列)의 증착원 노즐들을 포함하며, 상기 두 열(列)의 증착원 노즐들은 서로 마주보는 방향으로 틸트될 수 있다. Here, the deposition source nozzles of the plurality of deposition source nozzles evaporation source comprises a nozzle, wherein the two columns (列) of two columns (列) formed along the first direction may be tilted toward each other. 본 발명에 있어서, 상기 증착원은, 호스트 물질을 방사하는 제1 증착원과, 상기 제1 증착원의 일 측에 배치되며, 도펀트 물질을 방사하는 제2 증착원을 포함할 수 있다. In the present invention, the evaporation source is, and the first evaporation source for emitting host material, is disposed to one side of the first evaporation source, and may include a second evaporation source for emitting dopant material. 여기서, 상기 제1 증착원에서 방사되는 상기 호스트 물질의 적어도 일부와 상기 제2 증착원에서 방사되는 상기 도펀트 물질의 적어도 일부가 혼합될 수 있다. Here, at least a portion of the dopant material to be emitted from the first at least a part of the second evaporation source of the host material emitted from the evaporation source can be mixed. 여기서, 상기 제1 증착원과 상기 제2 증착원은 상기 제1 방향을 따라 나란하게 배치될 수 있다. The first deposition source and the second deposition source may be arranged side by side along said first direction. 여기서, 상기 증착원 노즐부는, 상기 제1 증착원의 일 측에 배치되며 상기 제1 방향을 따라 복수 개의 증착원 노즐들이 형성되는 제1 증착원 노즐부와, 상기 제2 증착원의 일 측에 배치되며 상기 제1 방향을 따라 복수 개의 증착원 노즐들이 형성되는 제2 증착원 노즐부를 포함할 수 있다. Here, the deposition source nozzle unit, is arranged on one side of the first evaporation source to one side from the first deposition source nozzle unit that is with a plurality of deposition source nozzles formed along the first direction, the second evaporation source arrangement and may include a second deposition source nozzle unit that is a plurality of deposition source nozzles are formed along the first direction. 여기서, 상기 제1 증착원 노즐부 및 상기 제2 증착원 노즐부 각각의 복수 개의 증착원 노즐들은 소정 각도 틸트 되도록 형성될 수 있다. The first deposition source nozzle unit and the second deposition source nozzle unit, each of the plurality of deposition source nozzles may be formed such that the predetermined tilt angle. 여기서, 상기 제1 증착원 노즐부의 증착원 노즐들과 상기 제2 증착원 노즐부의 증착원 노즐들은 서로 마주보는 방향으로 틸트될 수 있다. The first deposition source nozzle unit deposition source nozzles and the second deposition source nozzles deposition source nozzle unit can be tilted toward each other. 여기서, 상기 제1 증착원 노즐부의 증착원 노즐들과 상기 제2 증착원 노즐부의 증착원 노즐들은 상기 기판 전체에 걸쳐서 상기 호스트 물질과 상기 도펀트 물질의 혼합비율이 균일해지도록 틸트될 수 있다. The first deposition source nozzle unit deposition source nozzles and the second vapor deposition source nozzle unit source nozzles may be tilted over the entire substrate so that the mixing ratio of the host material and the dopant material uniformly. 여기서, 상기 제1 증착원과 상기 제2 증착원은 각각 선형 소스(linear source)로 형성될 수 있다. The first deposition source and the second deposition source may be formed of a linear source (linear source), respectively. 여기서, 상기 제1 증착원은 선형 소스(linear source)로 형성되고, 상기 제2 증착원은 하나 이상의 점 소스(point source)로 형성될 수 있다. The first evaporation source can be formed of a linear source is formed from a (linear source), and the second evaporation source is at least one point source (point source). 여기서, 상기 제1 증착원은 복수 개의 점 소스(point source)로 형성되고, 상기 제2 증착원은 하나 이상의 점 소스(point source)로 형성되며, 상기 제1 증착원을 구성하는 복수 개의 점 소스(point source)들은 회전 가능한 리볼버(revolver) 형태로 형성될 수 있다. The first evaporation source is formed of a plurality of point source (point source), the second evaporation source is a plurality of point source that is formed of at least one point source (point source), constituting the first evaporation source (point source) may be formed with a rotatable revolver (revolver) form. 본 발명에 있어서, 상기 박막 증착 장치는 상기 증착원, 상기 증착원 노즐부 및 상기 패터닝 슬릿 시트로 구성된 박막 증착 어셈블리를 복수 개 구비할 수 있다. In the present invention, the film deposition apparatus may include a plurality of the evaporation source, a thin film deposition assembly consisting of the deposition source nozzle unit and the patterning slit sheet. 다른 측면에 관한 본 발명은, 기판상에 박막을 형성하기 위한 박막 증착 장치에 있어서, 상기 박막 증착 장치는 복수 개의 박막 증착 어셈블리들을 포함하고, 상기 복수 개의 박막 증착 어셈블리들 각각은, 증착 물질을 방사하는 증착원; The present invention provides a film deposition apparatus for forming a thin film on a substrate, the film deposition apparatus comprises a plurality of thin film deposition assemblies, each of the plurality of thin film deposition assemblies, emitting the deposition material on the other side an evaporation source that; 상기 증착원의 일 측에 배치되며, 제1 방향을 따라 복수 개의 증착원 노즐들이 형성되는 증착원 노즐부; Deposition source nozzle unit that is disposed on one side of the evaporation source, a plurality of deposition source nozzles are formed along a first direction; 및 상기 증착원 노즐부와 대향되게 배치되고, 상기 제1 방향에 대해 수직인 제2 방향을 따라 복수 개의 패터닝 슬릿들이 형성되는 패터닝 슬릿 시트를 포함하고, 상기 기판이 상기 박막 증착 장치에 대하여 상기 제1 방향을 따라 이동하면서 증착이 수행되는 것을 특징으로 하는 박막 증착 장치를 제공한다. And wherein with respect to including the patterning slit sheet in which a plurality of patterning slits are formed, and the substrate on which the film deposition apparatus in accordance with the vertical in a second direction with respect to the first direction and disposed opposite to the deposition source nozzle unit, while moving along the first direction and provides a film deposition apparatus characterized in that the deposition is carried out. 본 발명에 있어서, 상기 각각의 박막 증착 어셈블리의 상기 증착원, 상기 증착원 노즐부 및 상기 패터닝 슬릿 시트는 일체로 형성될 수 있다. In the present invention, each of the deposition source of the thin film deposition assemblies, the evaporation source nozzle unit and the patterning slit sheet may be integrally formed. 여기서, 상기 각각의 박막 증착 어셈블리의 상기 증착원 및 상기 증착원 노즐부와 상기 패터닝 슬릿 시트는 연결 부재에 의해 결합되어 일체로 형성될 수 있다. Here, the evaporation source of each of the thin film deposition assemblies, and the deposition source nozzle unit and the patterning slit sheet may be integrally formed are coupled by a connecting member. 본 발명에 있어서, 상기 각각의 박막 증착 어셈블리의 상기 패터닝 슬릿 시트는 상기 기판보다 작게 형성될 수 있다. In the present invention, the patterning slit sheet of each of the thin film deposition assembly may be smaller than the substrate. 본 발명에 있어서, 상기 복수 개의 박막 증착 어셈블리들의 각 증착원에는 별개의 증착 물질들이 각각 구비될 수 있다. In the present invention, each evaporation source of the plurality of thin film deposition assembly has a separate deposition material may be provided, respectively. 본 발명에 있어서, 상기 복수 개의 박막 증착 어셈블리들의 각 증착원에 구비된 각 증착 물질들이 동시에 상기 기판상에 증착될 수 있다. In the present invention, each of the evaporation material that is provided on each of the evaporation source of the plurality of thin film deposition assemblies, may be deposited simultaneously on the substrate. 본 발명에 있어서, 상기 박막 증착 어셈블리들은 적어도 세 개가 구비되며, 상기 적어도 세 개의 박막 증착 어셈블리들의 각 증착원에 구비되는 증착 물질은 각각, 적색 발광층 재료, 녹색 발광층 재료 및 청색 발광층 재료일 수 있다. In the present invention, the thin film deposition assembly may be provided with at least three, at least the deposition material which is provided for each evaporation source of the three thin film deposition assemblies may be, respectively, the red light emitting layer material, a green light emitting layer material, and a blue light emitting layer material. 본 발명에 있어서, 상기 복수 개의 박막 증착 어셈블리들의 각 증착원들은, 각 증착원 별로 증착 온도가 제어 가능하도록 구비될 수 있다. In the present invention, each evaporation source of the plurality of thin film deposition assemblies, may be provided to enable the deposition temperature control for each evaporation source. 본 발명에 있어서, 상기 복수 개의 박막 증착 어셈블리들의 각 증착원들은, 각 증착원 별로 증착량의 제어가 가능하도록 구비될 수 있다. In the present invention, each evaporation source of the plurality of thin film deposition assemblies, may be provided to enable control of the deposition amount of each evaporation source. 상기한 바와 같이 이루어진 본 발명의 박막 증착 장치에 따르면, 제조가 용이하고, 대형 기판 양산 공정에 용이하게 적용될 수 있으며, 제조 수율 및 증착 효율이 향상되는 효과를 얻을 수 있다. According to the film deposition apparatus of the present invention made as described above, can be manufactured easily and readily applied to the large-sized board production process, it is possible to obtain the effects manufacturing yield and deposition efficiency are improved. 도 1은 본 발명의 일 실시예에 관한 박막 증착 장치를 개략적으로 도시한 사시도이다. 1 is a perspective view schematically illustrating a film deposition apparatus according to an embodiment of the present invention. 도 4는 본 발명의 제2 실시예에 따른 박막 증착 장치의 패터닝 슬릿 시트를 나타내는 도면이다. Figure 4 is a view showing a patterning slit sheet of the thin film deposition apparatus according to a second embodiment of the present invention. 도 5는 본 발명의 제3 실시예에 따른 박막 증착 장치의 패터닝 슬릿 시트를 나타내는 도면이다. 5 is a view showing a patterning slit sheet of the thin film deposition apparatus according to a third embodiment of the present invention. 도 6은 본 발명의 제4 실시예에 따른 박막 증착 장치를 나타내는 도면이다. 6 is a view showing a film deposition apparatus according to a fourth embodiment of the present invention. 도 7은 본 발명에 따른 박막 증착 장치에서 증착원 노즐을 틸트시키지 아니하였을 때 기판에 증착된 증착막의 분포 형태를 개략적으로 나타내는 도면이다. 7 is a view schematically showing the distribution of the deposited film deposited on the substrate when no not tilt the deposition source nozzles in the film deposition apparatus according to the present invention. 도 8은 본 발명에 따른 박막 증착 장치에서 증착원 노즐을 틸트시켰을 때 기판에 증착된 증착막의 분포 형태를 개략적으로 나타내는 도면이다. 8 is a view schematically showing the distribution of the deposited film deposited on the substrate when the tilt sikyeoteul the deposition source nozzles in the film deposition apparatus according to the present invention. 도 9는 본 발명의 제5 실시예에 따른 박막 증착 장치를 나타내는 도면이다. 9 is a view showing a film deposition apparatus according to a fifth embodiment of the present invention. 도 10은 본 발명의 제6 실시예에 따른 박막 증착 장치를 나타내는 도면이다. 10 is a view showing a film deposition apparatus according to a sixth embodiment of the present invention. 도 11은 본 발명의 제7 실시예에 따른 박막 증착 장치를 나타내는 도면이다. 11 is a view showing a film deposition apparatus according to a seventh embodiment of the present invention. 도 12는 본 발명의 제8 실시예에 따른 박막 증착 장치를 나타내는 도면이다. 12 is a view showing a film deposition apparatus according to an eighth embodiment of the present invention. 도 13은 본 발명의 제9 실시예에 따른 박막 증착 장치를 나타내는 도면이다. 13 is a view showing a film deposition apparatus according to a ninth embodiment of the present invention. 도 14는 본 발명의 증착 장치를 이용하여 제조된 액티브 매트릭스형 유기 발광 디스플레이 장치의 단면을 도시한 것이다. Figure 14 shows a cross-section of the active matrix type organic light emitting display device manufactured by using the deposition device of the present invention. 이하 첨부된 도면을 참조하여 본 발명에 따른 바람직한 실시예를 상세하게 설명하면 다음과 같다. In more detail a preferred embodiment according to the present invention with reference to the accompanying drawings as follows. 도 1은 본 발명의 일 실시예에 관한 박막 증착 장치를 개략적으로 도시한 사시도이고, 도 2는 도 1의 박막 증착 장치의 개략적인 측면도이고, 도 3은 도 1의 박막 증착 장치의 개략적인 평면도이다. Figure 1 is a perspective view schematically illustrating a film deposition apparatus according to an embodiment of the present invention, Figure 2 is a schematic plan view of a schematic side view, and Figure 3 is a thin-film deposition of Fig unit of the film deposition apparatus of Figure 1 to be. 도 1, 도 2 및 도 3을 참조하면, 본 발명의 일 실시예에 관한 박막 증착 장치(100)는 증착원(110), 증착원 노즐부(120) 및 패터닝 슬릿 시트(150)를 포함한다. 1, 2 and 3, the film deposition apparatus 100 according to one embodiment of the present invention includes a deposition source 110, a deposition source nozzle unit 120 and the patterning slit sheet 150, . 여기서, 도 1, 도 2 및 도 3에는 설명의 편의를 위해 챔버를 도시하지 않았지만, 도 1 내지 도 3의 모든 구성은 적절한 진공도가 유지되는 챔버 내에 배치되는 것이 바람직하다. Here, 1, 2, and although not shown in Figure 3 in the chamber for ease of explanation, all the configuration of 1 to 3 are preferably disposed in the chamber an appropriate degree of vacuum maintained. 이는 증착 물질의 직진성을 확보하기 위함이다. This is to ensure the straightness of the deposition material. 상세히, 증착원(110)에서 방출된 증착 물질(115)이 증착원 노즐부(120) 및 패터닝 슬릿 시트(150)를 통과하여 기판(400)에 원하는 패턴으로 증착되게 하려면, 기본적으로 챔버(미도시) 내부는 FMM 증착 방법과 동일한 고진공 상태를 유지해야 한다. In detail, the evaporation source 110, a deposition material 115, the deposition source nozzle unit 120 and the pattern passes through the slit sheet 150 to be deposited in the desired pattern on the substrate (400) emitted from, by default, the chamber (not shown City) inside has to maintain the same high vacuum conditions and the FMM deposition method. 또한 패터닝 슬릿 시트(150)의 온도가 증착원(110) 온도보다 충분히 낮아야(약 100°이하) 한다. Also, the patterning slit sheet 150 is sufficiently lower than the temperature of the evaporation source 110, temperature (up to about 100 °). 왜냐하면, 패터닝 슬릿 시트(150)의 온도가 충분히 낮아야만 온도에 의한 패터닝 슬릿 시트(150)의 열팽창 문제를 최소화할 수 있기 때문이다. This is because there is a temperature of the patterning slit sheet 150 to minimize the problem of thermal expansion of the patterning slit sheet 150 by only the temperature be sufficiently low. 이러한 챔버(미도시) 내에는 피 증착체인 기판(400)이 배치된다. Within this chamber (not shown) is disposed in the vapor-deposited substrate chain 400. 상기 기판(400)은 평판 표시장치용 기판이 될 수 있는데, 다수의 평판 표시장치를 형성할 수 있는 마더 글라스(mother glass)와 같은 대면적 기판이 적용될 수 있다. The substrate 400 is a flat panel display device, there can be a substrate for, a large-area substrate such as a mother glass (mother glass) capable of forming a plurality of flat panel display devices can be applied. 여기서, 본 발명의 일 실시예에서는, 기판(400)이 박막 증착 장치(100)에 대하여 상대적으로 이동하면서 증착이 진행되는 것을 일 특징으로 한다. Here, in one embodiment of the invention, it is characterized in that the one substrate 400, the deposition is in progress, while relatively moving with respect to the film deposition apparatus (100). 상세히, 기존 FMM 증착 방법에서는 FMM 크기가 기판 크기와 동일하게 형성되어야 한다. In detail, in the conventional FMM deposition method it should be the FMM size formed in the same manner as the substrate size. 따라서, 기판 사이즈가 증가할수록 FMM도 대형화되어야 하며, 이로 인해 FMM 제작이 용이하지 않고, FMM을 인장하여 정밀한 패턴으로 얼라인(align) 하기도 용이하지 않다는 문제점이 존재하였다. Thus, with increasing size of the substrate to be even larger FMM, which is a problem making the FMM does not readily, and may not easily pulled the FMM (align) aligned in a precise pattern was observed due. 이와 같은 문제점을 해결하기 위하여, 본 발명의 일 실시예에 관한 박막 증착 장치(100)는, 박막 증착 장치(100)와 기판(400)이 서로 상대적으로 이동하면서 증착이 이루어지는 것을 일 특징으로 한다. In order to solve this problem, the film deposition apparatus 100 according to one embodiment of the present invention is that the film deposition apparatus 100 and the substrate 400 is, while relatively moving the deposition takes place from each other in one aspect. 다시 말하면, 박막 증착 장치(100)와 마주보도록 배치된 기판(400)이 Y축 방향을 따라 이동하면서 연속적으로 증착을 수행하게 된다. In other words, it is successively performed the deposition while moving along the film deposition apparatus 100 and the substrate 400 is disposed to face the Y-axis direction. 즉, 기판(400)이 도 1의 화살표 A 방향으로 이동하면서 스캐닝(scanning) 방식으로 증착이 수행되는 것이다. In other words, the substrate 400, the mobility in the direction of arrow A while the first deposition is performed by scanning (scanning) scheme. 여기서, 도면에는 기판(400)이 챔버(미도시) 내에서 Y축 방향으로 이동하면서 증착이 이루어지는 것으로 도시되어 있으나, 본 발명의 사상은 이에 제한되지 아니하며, 기판(400)은 고정되어 있고 박막 증착 장치(100) 자체가 Y축 방향으로 이동하면서 증착을 수행하는 것도 가능하다 할 것이다. Here, the drawing board 400, the chamber (not shown) while moving in the Y-axis direction in the are illustrated by evaporation is made, shall not features of the present invention is limited to this, and the substrate 400 are fixed and the film deposition the apparatus 100 will itself is also possible to perform deposition while moving in the Y-axis direction. 따라서, 본 발명의 박막 증착 장치(100)에서는 종래의 FMM에 비하여 훨씬 작게 패터닝 슬릿 시트(150)를 만들 수 있다. Therefore, in the film deposition apparatus 100 of the present invention can be made much smaller patterning slit sheet 150 as compared to the conventional FMM. 즉, 본 발명의 박막 증착 장치(100)의 경우, 기판(400)이 Y축 방향을 따라 이동하면서 연속적으로, 즉 스캐닝(scanning) 방식으로 증착을 수행하기 때문에, 패터닝 슬릿 시트(150)의 X축 방향 및 Y축 방향의 길이는 기판(400)의 길이보다 훨씬 작게 형성될 수 있는 것이다. That is, in the case of film deposition apparatus 100 of the present invention, substrate 400 is continuously moving along the Y-axis direction, that is, to carry out the deposition in the scanning (scanning) scheme, X of the patterning slit sheet 150, axis direction and the length in the Y-axis direction is to be formed much smaller than the length of the substrate 400. 이와 같이, 종래의 FMM에 비하여 훨씬 작게 패터닝 슬릿 시트(150)를 만들 수 있기 때문에, 본 발명의 패터닝 슬릿 시트(150)는 그 제조가 용이하다. Thus, it is possible to create a much smaller patterning slit sheet 150 compared to a conventional FMM, the patterning slit sheet 150 of the present invention, it is easy for manufacturing. 즉, 패터닝 슬릿 시트(150)의 에칭 작업이나, 그 이후의 정밀 인장 및 용접 작업, 이동 및 세정 작업 등 모든 공정에서, 작은 크기의 패터닝 슬릿 시트(150)가 FMM 증착 방법에 비해 유리하다. That is, the etching operation or the patterning slit sheet 150, which is advantageous compared to the subsequent tensioning and precision welding, moving, and cleaning operation, etc. In any process, the patterning slit sheet 150, the FMM deposition method of a small size. 또한, 이는 디스플레이 장치가 대형화될수록 더욱 유리하게 된다. Further, it is more advantageous the more large-sized display device. 이와 같이, 박막 증착 장치(100)와 기판(400)이 서로 상대적으로 이동하면서 증착이 이루어지기 위해서는, 박막 증착 장치(100)와 기판(400)이 일정 정도 이격되는 것이 바람직하다. In this way, it is preferable that In order for the deposition is done by moving the film deposition apparatus 100 and the substrate 400 relative to each other, the film deposition apparatus 100 and the substrate 400 are spaced a certain degree. 이에 대하여는 뒤에서 상세히 기술하기로 한다. This respect will be described in detail later. 상세히, 증착원(110)은 그 내부에 증착 물질(115)이 채워지는 도가니(111)와, 도가니(111)를 가열시켜 도가니(111) 내부에 채워진 증착 물질(115)을 도가니(111)의 일 측, 상세하게는 증착원 노즐부(120) 측으로 증발시키기 위한 히터(112)를 포함한다. In detail, the evaporation source 110 of deposition material 115 is filled in the crucible 111 and, by heating the crucible 111, a crucible 111, a deposition material crucible 111 to 115 filled inside therein one side, specifically, includes a heater 112 for evaporating the side of the evaporation source nozzle unit 120. 증착원(110)의 일 측, 상세하게는 증착원(110)에서 기판(400)을 향하는 측에는 증착원 노즐부(120)가 배치된다. One side of the deposition source 110, and specifically, the deposition source nozzle unit 120 towards the side of the substrate 400 from the deposition source 110 is disposed. 그리고, 증착원 노즐부(120)에는, Y축 방향 즉 기판(400)의 스캔 방향을 따라서 복수 개의 증착원 노즐(121)들이 형성된다. Then, the deposition source nozzle unit 120 is, Y axis direction, that is along the scan direction of the substrate 400 is formed with a plurality of deposition source nozzles 121. 여기서, 상기 복수 개의 증착원 노즐(121)들은 등 간격으로 형성될 수 있다. Here, the plurality of deposition source nozzles 121 may be formed at equal intervals. 증착원(110) 내에서 기화된 증착 물질(115)은 이와 같은 증착원 노즐부(120)를 통과하여 피 증착체인 기판(400) 쪽으로 향하게 되는 것이다. Evaporation source 110. The deposition material 115 that is vaporized in the is In this connection, such as through the deposition source nozzle unit (120) facing towards the vapor-deposited substrate chain 400. 이와 같이, 증착원 노즐부(120) 상에 Y축 방향 즉 기판(400)의 스캔 방향을 따라서 복수 개의 증착원 노즐(121)들이 형성할 경우, 패터닝 슬릿 시트(150)의 각각의 패터닝 슬릿(151)들을 통과하는 증착 물질에 의해 형성되는 패턴의 크기는 증착원 노즐(121) 하나의 크기에만 영향을 받으므로(즉, X축 방향으로는 증착원 노즐(121)이 하나만 존재하는 것에 다름 아니므로), 음영(shadow)이 발생하지 않게 된다. Thus, the deposition source nozzle unit (120), Y-axis direction on that is, to a plurality of deposition source nozzles 121 are formed along the scan direction of the substrate 400, each of the patterning slits of the patterning slit sheet 150 ( 151) the size of the pattern formed by the deposited material that passes through the deposition source nozzle 121, because only affected one size (that is, X axis direction as the deposition source nozzles 121 is not different from that present in only one is a) shade (shadow) does not occur. 또한, 다수 개의 증착원 노즐(121)들이 스캔 방향으로 존재하므로, 개별 증착원 노즐 간 플럭스(flux) 차이가 발생하여도 그 차이가 상쇄되어 증착 균일도가 일정하게 유지되는 효과를 얻을 수 있다. Further, the plurality of deposition source nozzles 121 are therefore present in the scan direction, are also offset by the difference in the individual evaporation sources the flux (flux), difference occurs between a nozzle effect can be obtained that remains a constant deposition uniformity. 한편, 증착원(110)과 기판(400) 사이에는 패터닝 슬릿 시트(150) 및 프레임(155)이 더 구비된다. On the other hand, between the evaporation source 110 and the substrate 400, the patterning slit sheet 150 and a frame 155 are further provided. 프레임(155)은 대략 창문 틀과 같은 형태로 형성되며, 그 내측에 패터닝 슬릿 시트(150)가 결합된다. Frame 155 is substantially formed in the shape such as a window frame, the patterning slit sheet 150 is coupled to its inside. 그리고, 패터닝 슬릿 시트(150)에는 X축 방향을 따라서 복수 개의 패터닝 슬릿(151)들이 형성된다. Then, the patterning slit sheet 150 includes a plurality of patterning slits 151 are formed along the X-axis direction. 증착원(110) 내에서 기화된 증착 물질(115)은 증착원 노즐부(120) 및 패터닝 슬릿 시트(150)를 통과하여 피 증착체인 기판(400) 쪽으로 향하게 되는 것이다. The deposition material 115 is vaporized in the deposition source 110 is to be directed towards the deposition source nozzle unit 120 and the patterning slit through the sheet 150, the vapor-deposited substrate chain 400. 이때, 상기 패터닝 슬릿 시트(150)는 종래의 파인 메탈 마스크(FMM) 특히 스트라이프 타입(stripe type)의 마스크의 제조 방법과 동일한 방법인 에칭을 통해 제작될 수 있다. At this time, the patterning slit sheet 150 may be manufactured through the same method as the etching method for manufacturing a mask of a conventional fine metal mask (FMM), in particular a stripe type (stripe type). 이때, 증착원 노즐(121)들의 총 개수보다 패터닝 슬릿(151)들의 총 개수가 더 많게 형성될 수 있다. At this time, the total number of patterning slits 151 than the total number of deposition source nozzles 121 may be formed of a lot more. 한편, 상술한 증착원(110)(및 이와 결합된 증착원 노즐부(120))과 패터닝 슬릿 시트(150)는 서로 일정 정도 이격되도록 형성될 수 있으며, 증착원(110)(및 이와 결합된 증착원 노즐부(120))과 패터닝 슬릿 시트(150)는 연결 부재(135)에 의하여 서로 연결될 수 있다. On the other hand, the evaporation source mentioned above (110) (and the combined deposition source nozzle unit 120) is and the patterning slit sheet 150 may be formed to each other to some extent apart, the evaporation source 110 (and the coupled deposition source nozzle unit 120) and the patterning slit sheet 150 may be connected to each other by the connection member 135. 즉, 증착원(110), 증착원 노즐부(120) 및 패터닝 슬릿 시트(150)가 연결 부재(135)에 의해 연결되어 서로 일체로 형성될 수 있는 것이다. That is, they are connected by a deposition source 110, a deposition source nozzle unit 120 and the patterning slit sheet 150, the connection member 135 to each other can be integrally formed. 여기서 연결 부재(135)들은 증착원 노즐(121)을 통해 배출되는 증착 물질이 분산되지 않도록 증착 물질의 이동 경로를 가이드 할 수 있다. The connection member 135 may guide the movement path of the deposition material from being dispersed the deposited material is discharged through the deposition source nozzles 121. 도면에는 연결 부재(135)가 증착원(110), 증착원 노즐부(120) 및 패터닝 슬릿 시트(150)의 좌우 방향으로만 형성되어 증착 물질의 X축 방향만을 가이드 하는 것으로 도시되어 있으나, 이는 도시의 편의를 위한 것으로, 본 발명의 사상은 이에 제한되지 아니하며, 연결 부재(135)가 박스 형태의 밀폐형으로 형성되어 증착 물질의 X축 방향 및 Y축 방향 이동을 동시에 가이드 할 수도 있다. The drawings are illustrated as connecting member 135 is formed only in the lateral direction of the evaporation source 110, a deposition source nozzle unit 120 and the patterning slit sheet 150 guides only the X-axis direction of the evaporation material, which are for convenience of illustration, the scope of the present invention is not limited to this, the connecting member 135 is formed in a closed type of box shape can also guide the X-axis direction and the Y-axis direction movement of the deposition material at the same time. 상술한 바와 같이, 본 발명의 일 실시예에 관한 박막 증착 장치(100)는 기판(400)에 대하여 상대적으로 이동하면서 증착을 수행하며, 이와 같이 박막 증착 장치(100)가 기판(400)에 대하여 상대적으로 이동하기 위해서 패터닝 슬릿 시트(150)는 기판(400)으로부터 일정 정도 이격되도록 형성된다. As described above, the film deposition apparatus 100 according to an embodiment of the present invention with respect to the while relative movement performs a deposition, thus the film deposition apparatus 100 includes a substrate 400 with the substrate 400, in order to relatively move to the patterning slit sheet 150 it is formed to some extent away from the substrate 400. 이와 같은 문제점을 해결하기 위하여, 본 발명의 일 실시예에 관한 박막 증착 장치(100)에서는 패터닝 슬릿 시트(150)가 피 증착체인 기판(400)과 소정 간격을 두고 이격되도록 배치되도록 한다. In order to solve the problems, in the thin film deposition apparatus 100 according to one embodiment of the present invention so that the patterning slit sheet 150 is disposed so as to be spaced by a chain-deposited substrate 400 with a predetermined interval. 이와 같은 본 발명에 의해서 마스크를 기판보다 작게 형성한 후, 마스크를 기판에 대하여 이동시키면서 증착을 수행할 수 있게 됨으로써, 마스크 제작이 용이해지는 효과를 얻을 수 있다. Such being able to perform after formation of the mask to be smaller than the substrate by the present invention, while moving the deposition masks relative to the substrate, it is possible to obtain the effect that mask fabrication is easy. 또한, 기판과 마스크 간의 접촉에 의한 불량을 방지하는 효과를 얻을 수 있다. In addition, it is possible to obtain the effect of preventing the failure due to contact between the substrate and the mask. 또한, 공정에서 기판과 마스크를 밀착시키는 시간이 불필요해지기 때문에, 제조 속도가 향상되는 효과를 얻을 수 있다. In addition, since it requires no time to contact the substrate and the mask in the process, it is possible to obtain the effect of the production rate is improved. 도 4는 본 발명의 제2 실시예에 따른 박막 증착 장치의 패터닝 슬릿 시트(150)를 나타내는 도면이다. 4 is a view showing the patterning slit sheet 150 of the film deposition apparatus according to a second embodiment of the present invention. 본 실시예에서는 패터닝 슬릿 시트(150)의 일 측에 보정판(157)이 더 구비된다는 점에서 전술한 제1 실시예와 구별된다. This embodiment is distinguished from the one side to the compensator 157, the above-described first example in the point that this further comprises a patterning slit sheet 150. 상세히, 본 발명의 제2 실시예에 따른 박막 증착 장치는 기판 전체의 막 균일도를 확보하기 위해서 보정판(157)을 더 구비할 수 있다. In detail, the film deposition apparatus according to a second embodiment of the present invention may further include a compensation plate (157) in order to ensure the uniformity of the film the whole substrate. 유기물 방사는 코사인 법칙(cosing law)에 따라 증착원 노즐(도 1의 121 참조)에 수직인 부분으로 가장 많은 유기물이 방사되고, 패터닝 슬릿 시트(150)의 양끝으로 갈수록 방사되는 유기물의 양이 감소한다. Organic radiation cosine law (cosing law) in the evaporation source nozzle (see 121 in FIG. 1) in a reduced amount of organic material the most organic materials in the vertical portion is emitted, gradually emitted to the both ends of the patterning slit sheet 150 in response to do. 따라서, 보정판을 구비하지 아니한 박막 증착 장치의 경우, 중앙 부분이 볼록한 형태를 보이도록 증착막이 형성된다. Accordingly, in the case of the film deposition apparatus other than those having a compensation plate, a deposition film is formed to show the center of the convex shape. 이와 같은 증착막 두께의 불균일 현상을 제거하기 위해서, 도 4에 도시된 바와 같은 보정판(157)이 패터닝 슬릿 시트(150)의 일 측에 구비될 수 있다. In order to eliminate this non-uniformity phenomenon of the same deposition layer thickness, it may be provided on one side of the compensation plate 157. This patterning slit sheet 150, as shown in FIG. 보정판(157)은 패터닝 슬릿 시트(150)의 일 면 상에 대략 원호 또는 코사인 곡선 형상으로 배치된다. Compensator 157 are arranged in a substantially circular arc or a cosine curve shape on the one surface of the patterning slit sheet 150. 이와 같은 보정판(157)은 증착원 노즐(도 1의 121 참조)로부터 패터닝 슬릿(도 1의 151 참조) 쪽으로 이동하는 증착 물질 중 일부를 차단하는 역할을 수행한다. Such a compensation plate 157 serves to block some of the deposition material to move towards the deposition source nozzle (see 151 in FIG. 1) (see 121 in FIG. 1) is patterned from the slit. 즉, 박막 증착 장치에 의하여 증착되는 증착막은 중앙 부분이 볼록한 형태를 이루기 때문에, 이를 균일하게 만들기 위해서는 중앙 부분으로 향하는 증착 물질 중 일부를 차단하여야 한다. That is, the deposition layer is deposited by a film deposition apparatus, since to achieve a convex central portion forms, in order to make it uniformly to be cut off a portion of the deposited material toward the center portion. 따라서, 보정판(157)을 증착 물질의 이동 경로 중간에 배치하여, 증착 물질 중 일부를 차단한다. Thus, by placing a compensation plate (157) to move the intermediate path of the deposition material, and blocks a part of the deposited material. 이때, 보정판(157)은 원호 내지 코사인 곡선 형상으로 형성되기 때문에, 상대적으로 돌출 형성된 중앙 부분에는 증착 물질이 많이 충돌하게 되어 증착 물질을 더 많이 차단하게 되고, 가장자리 부분에는 증착 물질이 덜 충돌하게 되어 증착 물질을 더 적게 차단하게 되는 것이다. In this case, the compensation plate 157 are formed in an arc to a cosine curve shape, it becomes a central portion formed of relatively projecting there collision lot of deposited material is blocked more of the deposited material, the edge part is the less impact the deposited material It will be blocked for less deposited material. 이 경우, 막 두께가 가장 얇은 부분, 일반적으로는 패터닝 슬릿 시트(150)의 양끝 부분의 막 두께가 전체 막 두께가 되도록 보정판(157)을 형성할 수 있다. In this case, the film is the thinnest portion of the thickness, in general, it is possible to form a compensator (157) such that the total thickness of the thickness of each end portion of the patterning slit sheet 150. 이와 같이, 증착 물질의 이동 경로에 보정판을 배치함으로써, 박막 증착 장치에 의하여 증착된 증착막이 보정될 수 있다. In this way, by placing a compensation plate on a movement path of the deposition material may be deposited vapor-deposited film is corrected by the film deposition apparatus. 즉, 증착 물질이 많이 증착되는 부분은 보정판의 높이를 크게 하여 증착 물질을 많이 차단하고, 증착 물질이 적게 증착되는 부분은 보정판의 높이를 작게 하여 증착 물질을 적게 차단함으로써, 전체적인 증착 물질의 두께가 균일하도록 증착량을 보정하는 것이다. That is, the portion of the deposited material is more deposited significantly the height of the compensation plate to many blocks the deposited material, and part of the deposited material is less deposition is reduced by blocking less deposited material the height of the compensation plate, the thickness of the entire deposition material that is to compensate for the amount of deposition uniformity. 본 발명에 의해서 기판에 증착된 박막의 균일도가 1~2% 오차 범위 이내로 균일하게 형성됨으로써, 제품 품질 및 신뢰성이 향상되는 효과를 얻을 수 있다. By the uniformity of the deposited film on the substrate formed uniformly within 1-2% error range by the present invention, it is possible to obtain the effect of improving product quality and reliability. 도 5는 본 발명의 제3 실시예에 따른 박막 증착 장치의 패터닝 슬릿 시트(150)를 나타내는 도면이다. 5 is a diagram illustrating the patterning slit sheet 150 of the film deposition apparatus according to a third embodiment of the present invention. 본 실시예에서는 기판 전체의 막 균일도를 확보하기 위해서 패터닝 슬릿 시트(150)의 중심 부분의 패터닝 슬릿(151a)의 길이가 패터닝 슬릿 시트(150)의 양단부의 패터닝 슬릿(151b)의 길이보다 짧게 형성된다는 점에서 전술한 제1 실시예와 구별된다. In this embodiment shorter than a length of the patterning slit (151b) at both ends of the patterning slits (151a), the patterning slit sheet 150, the length of the central portion of the patterning slit sheet 150 in order to secure the film uniformity of the entire substrate to form a claim is distinguished from the first embodiment described above in that it is. 이와 같이 중심 부분의 패터닝 슬릿(151a)의 길이와 양단부의 패터닝 슬릿(151b)의 길이가 다르도록 형성된 패터닝 슬릿 시트(150)에 의하여, 상술한 제2 실시예에서와 같이, 전체적인 증착 물질의 두께가 균일하도록 증착량을 보정할 수 있다. Thus, by patterning slit sheet 150 is formed to a length different from the patterning slit (151a), the length and the patterning slit (151b) at both ends of the central portion, as in the above-described second embodiment, the thickness of the entire deposition material that it is possible to correct the deposited amount is uniform. 본 발명에 의해서 기판에 증착된 박막의 균일도가 1~2% 오차 범위 이내로 균일하게 형성됨으로써, 제품 품질 및 신뢰성이 향상되는 효과를 얻을 수 있다. By the uniformity of the deposited film on the substrate formed uniformly within 1-2% error range by the present invention, it is possible to obtain the effect of improving product quality and reliability. 도 6은 본 발명의 제4 실시예에 따른 박막 증착 장치를 나타내는 도면이다. 6 is a view showing a film deposition apparatus according to a fourth embodiment of the present invention. 도면을 참조하면, 본 발명의 제4 실시예에 따른 박막 증착 장치는 증착원(110), 증착원 노즐부(120) 및 패터닝 슬릿 시트(150)를 포함한다. Referring to the drawings, the film deposition apparatus according to a fourth embodiment of the present invention includes a deposition source 110, a deposition source nozzle unit 120 and the patterning slit sheet 150. 여기서, 증착원(110)은 그 내부에 증착 물질(115)이 채워지는 도가니(111)와, 도가니(111)를 가열시켜 도가니(111) 내부에 채워진 증착 물질(115)을 증착원 노즐부(120) 측으로 증발시키기 위한 히터(112)를 포함한다. Here, the evaporation source 110 and the deposition material 115 is filled in the crucible (111) therein and depositing a crucible 111, a deposition material 115 is filled by the inner crucible 111 is heated to source nozzle unit ( side 120) includes a heater 112 to evaporate. 한편, 증착원(110)의 일 측에는 증착원 노즐부(120)가 배치되고, 증착원 노즐부(120)에는 Y축 방향을 따라서 복수 개의 증착원 노즐(121)들이 형성된다. On the other hand, is arranged one deposition source nozzle unit 120 side of the evaporation source 110, a deposition source nozzle unit 120 has a plurality of deposition source nozzles 121 are formed along the Y-axis direction. 한편, 증착원(110)과 기판(400) 사이에는 패터닝 슬릿 시트(150) 및 프레임(155)이 더 구비되고, 패터닝 슬릿 시트(150)에는 X축 방향을 따라서 복수 개의 패터닝 슬릿(151)들이 형성된다. On the other hand, the evaporation source 110 and the substrate 400 between is provided with more patterning slit sheet 150 and the frame 155, the patterning slit sheet 150 includes a plurality of patterning slits 151 along the X-axis direction are It is formed. 그리고, 증착원(110) 및 증착원 노즐부(120)와 패터닝 슬릿 시트(150)는 연결 부재(135)에 의해서 결합된다. Then, the evaporation source 110 and the deposition source nozzle unit 120 and the patterning slit sheet 150 is coupled by a connecting member 135. 본 실시예에서는, 증착원 노즐부(120)에 형성된 복수 개의 증착원 노즐(121)들이 소정 각도 틸트(tilt)되어 배치된다는 점에서 전술한 제1 실시예와 구별된다. In this embodiment, the plurality of deposition source nozzles 121 formed on the deposition source nozzle unit 120 are distinguished from the predetermined tilt angle (tilt) of the foregoing first embodiment in that that arrangement is. 상세히, 증착원 노즐(121)은 두 열의 증착원 노즐(121a)(121b)들로 이루어질 수 있으며, 상기 두 열의 증착원 노즐(121a)(121b)들은 서로 교번하여 배치된다. In detail, the evaporation source nozzle 121 may be comprised of two rows of evaporation source nozzle (121a), (121b), the two rows of evaporation source nozzles (121a) (121b) are arranged alternately with each other. 이때, 증착원 노즐(121a)(121b)들은 XZ 평면상에서 소정 각도 기울어지도록 틸트(tilt)되어 형성될 수 있다. In this case, the deposition source nozzles (121a) (121b) may be formed to tilt (tilt) tilted a predetermined angle on the XZ plane. 상술한 제2 실시예에서와 같이 보정판(도 4의 157 참조)을 구비하거나, 제3 실시예에서와 같이 패터닝 슬릿(도 5의 151)의 길이를 차등화시킬 경우, 증착 재료가 보정판 또는 패터닝 슬릿에 의하여 차단되기 때문에, 재료의 이용 효율이 감소할 수 있다. The above-described second exemplary correction plate as in the example (see 157 in Fig. 4) for having, or, in the case to differentiate the lengths of the patterning slits (151 in Fig. 5) as in the third embodiment, the deposition material is correction plate or the patterning slit since the block makes it possible to use efficiency of the material it is reduced. 따라서 본 실시예에서는 증착원 노즐(121a)(121b)들이 소정 각도 틸트되어 배치되도록 한다. Therefore, the evaporation source nozzle (121a) (121b) in this embodiment are arranged such that the tilt a predetermined angle. 여기서, 제1 열의 증착원 노즐(121a)들은 제2 열의 증착원 노즐(121b)들을 바라보도록 틸트되고, 제2 열의 증착원 노즐(121b)들은 제1 열의 증착원 노즐(121a)들을 바라보도록 틸트될 수 있다. Here, the first row of the evaporation source nozzle (121a) are the second column, the vapor deposition source nozzle (121b) being's tilt at the second column, the vapor source nozzles (121b) are tilted to look the deposition source nozzles in the first row (121a) It can be. 다시 말하면, 왼쪽 열에 배치된 증착원 노즐(121a)들은 패터닝 슬릿 시트(150)의 오른쪽 단부를 바라보도록 배치되고, 오른쪽 열에 배치된 증착원 노즐(121b)들은 패터닝 슬릿 시트(150)의 왼쪽 단부를 바라보도록 배치될 수 있는 것이다. That is, the left end of the deposition source nozzles (121a) are the patterning slit sheet 150, the deposition source nozzles (121b) positioned and arranged to at the right end, the right column of their patterning slit sheet 150 is disposed in the left column which it will be placed at look. 도 7은 본 발명에 따른 박막 증착 장치에서 증착원 노즐을 틸트시키지 아니하였을 때 기판에 증착된 증착막의 분포 형태를 개략적으로 나타내는 도면이고, 도 8은 본 발명에 따른 박막 증착 장치에서 증착원 노즐을 틸트시켰을 때 기판에 증착된 증착막의 분포 형태를 개략적으로 나타내는 도면이다. Figure 7 is a deposition source nozzles in the film deposition apparatus according to a view schematically showing the distribution of the deposited deposition layer to the substrate when no not tilt the deposition source nozzles in the film deposition apparatus according to the present invention, Figure 8 is the invention when tilt sikyeoteul a view schematically showing the distribution of the deposited film deposited on the substrate. 도 7과 도 8을 비교하면, 증착원 노즐을 틸트시켰을 때 기판의 양단부에 성막되는 증착막의 두께가 상대적으로 증가하여 증착막의 균일도가 상승함을 알 수 있다. When compared with FIG. 7 to FIG. 8, and the deposited film thickness of the film formed on both ends of the substrate when the deposition source nozzle sikyeoteul tilt relative increase can be seen that the vapor-deposited film uniformity of the rise. 도 9는 본 발명의 제5 실시예에 따른 박막 증착 장치를 나타내는 도면이다. 9 is a view showing a film deposition apparatus according to a fifth embodiment of the present invention. 도면을 참조하면, 본 발명의 제5 실시예에 따른 박막 증착 장치는 제1 증착원(110), 제1 증착원 노즐부(120), 제2 증착원(160), 제2 증착원 노즐부(170) 및 패터닝 슬릿 시트(150)를 포함한다. Referring to the drawings, the film deposition apparatus according to a fifth embodiment of the present invention comprises a first evaporation source 110, a first deposition source nozzle unit 120, the second deposition source 160 and the second deposition source nozzle unit 170, and a patterning slit sheet 150. 여기서, 증착원(110)과 기판(400) 사이에는 패터닝 슬릿 시트(150) 및 프레임(155)이 구비되고, 패터닝 슬릿 시트(150)에는 X축 방향을 따라서 복수 개의 패터닝 슬릿(151)들이 형성된다. Here, the evaporation source 110 and the substrate 400 between is provided with the patterning slit sheet 150 and the frame 155, the patterning slit sheet 150 includes a plurality of patterning slits 151 along the X-axis direction are formed do. 그리고, 증착원(110) 및 증착원 노즐부(120)와 패터닝 슬릿 시트(150)는 연결 부재(135)에 의해서 결합된다. Then, the evaporation source 110 and the deposition source nozzle unit 120 and the patterning slit sheet 150 is coupled by a connecting member 135. 본 실시예에서는, 호스트 물질(115)을 증착하는 제1 증착원(110)과 도펀트 물질(미도시)을 증착하는 제2 증착원(160)을 구비하여, 기판(400)상에 호스트 물질(115)과 도펀트 물질(미도시)을 동시에 증착할 수 있도록 한다는 점에서 전술한 제1 실시예와 구별된다. In the present embodiment, the first deposition source 110 and the dopant material a second deposition source 160 to the host material on the substrate 400 provided with a depositing a (not shown) for depositing a host material 115, ( 115) and is a distinct from the first embodiment described above in that it allows depositing a dopant material (not shown) at the same time. 즉, 호스트 물질(115)과 도펀트 물질(미도시)의 승화 온도가 서로 다르기 때문에, 호스트 물질(115)과 도펀트 물질(미도시)을 동시에 증착하기 위해서, 증착원 및 노즐부를 복수로 구성하는 것이다. That is, since the sublimation temperature of the host material 115 and a dopant material (not shown) different from each other, to in order to deposit a host material 115 and a dopant material (not shown) at the same time, consists of a plurality vapor source and the nozzle portion . 상세히, 챔버 내에서 기판(400)과 대향하는 측에는, 증착 물질이 수납 및 가열되는 제1 증착원(110) 및 제2 증착원(160)이 배치된다. In detail, the substrate first deposition source 110 and the second deposition source 160 is 400, the deposition material side facing the housing and the heat in the chamber is arranged. 제1 증착원(110) 및 제2 증착원(160) 내에 수납되어 있는 증착 물질이 기화됨에 따라 기판(400)에 증착이 이루어진다. The deposition is made in the first deposition source 110 and the second deposition source substrate 400. As the deposition material which is vaporized in the housing 160. The 즉, 제1 증착원(110)은 그 내부에 호스트 물질(115)이 채워지는 도가니(111)와, 도가니(111)를 가열시켜 도가니(111) 내부에 채워진 호스트 물질(115)을 도가니(111)의 일 측, 상세하게는 제1 증착원 노즐부(120) 측으로 증발시키기 위한 히터(112)를 포함한다. That is, the first evaporation source (110) is a crucible (111 a host material 115 is filled in the crucible 111 and, by heating the crucible 111, a crucible 111, the host material 115 is filled inside therein ) to one side, specifically a heater 112 for evaporating the side of the first deposition source nozzle unit 120 of. 한편, 제2 증착원(160)은 그 내부에 도펀트 물질(미도시)이 채워지는 도가니(161)와, 도가니(161)를 가열시켜 도가니(161) 내부에 채워진 도펀트 물질(미도시)을 도가니(161)의 일 측, 상세하게는 제1 증착원 노즐부(120) 측으로 증발시키기 위한 히터(미도시)를 포함한다. On the other hand, the second evaporation source (160) and a dopant material (not shown) is filled in the crucible (161) therein, by heating the crucible 161, a crucible 161, a dopant material (not shown) filled in the inner crucible. one side of 161, and specifically, a heater (not shown) for evaporating toward the first deposition source nozzle unit (120). 여기서, 상기 호스트 물질로는 트리스(8-히드록시-퀴놀리나토)알루미늄 (Alq3), 9,10-디(나프티-2-일)안트라센 (AND), 3-Tert-부틸-9,10-디(나프티-2-일)안트라센 (TBADN), 4,4'-비스(2,2-디페닐-에텐-1-일)-4,4'-디메틸페닐 (DPVBi), 4,4'-비스Bis(2,2-디페닐-에텐-1-일)-4,4'-디메틸페닐 (p-DMDPVBi), Tert(9,9-디아릴플루오렌)s (TDAF), 2-(9,9'-스피로비플루오렌-2-일)-9,9'-스피로비플루오렌(BSDF), 2,7-비스(9,9'-스피로비플루오렌-2-일)-9,9'-스피로비플루오렌 (TSDF), 비스(9,9-디아릴플루오렌)s (BDAF), 4,4'-비스(2,2-디페닐-에텐-1-일)-4,4'-디-(tert-부틸)페닐 (p-TDPVBi), 1,3-비스(카바졸-9-일)벤젠 (mCP), 1,3,5-트리스(카바졸-9-일)벤젠 (tCP), 4,4',4"-트리스(카바졸-9-일)트리페닐아민 (TcTa), 4,4'-비스(카바졸-9-일)비페닐 (CBP), 4,4'-비스Bis(9-카바졸일)-2,2'-디메틸-비페닐 (CBDP), 4,4'-비스(카바졸-9-일)-9,9-디메틸-플루오렌 (DM Here, as the host material are tris (8-hydroxy-quinolinato) aluminum (Alq3), 9,10- di (naphthyridin-2-yl) anthracene (AND), 3-butyl-9,10-Tert- di (naphthyridin-2-yl) anthracene (TBADN), 4,4'- bis (2,2-diphenyl-ethene-1-yl) -4,4'-dimethylphenyl (DPVBi), 4,4'- bis bis (2,2- diphenyl-ethene-1-yl) -4,4'-dimethylphenyl (p-DMDPVBi), Tert (9,9- diaryl fluorene) s (TDAF), 2- (9 , 9'- RY lobby fluorene-2-yl) -9,9'- RY lobby fluorene (BSDF), 2,7- bis (9,9'-RY lobby fluorene-2-yl) -9, 9'- RY lobby fluorene (TSDF), bis (9,9 diaryl fluorene) s (BDAF), 4,4'- bis (2,2-diphenyl-ethene-1-yl) -4, 4,4'-di - (tert- butyl) phenyl (p-TDPVBi), 1,3- bis (carbazol-9-yl) benzene (mCP), 1,3,5- tris (carbazol-9-yl) benzene (tCP), 4,4 ', 4 "- tris (carbazol-9-yl) triphenylamine (TcTa), 4,4'- bis (carbazol-9-yl) biphenyl (CBP), 4 4,4'-bis bis (9- carbazolyl) -2,2'-dimethyl-biphenyl (CBDP), 4,4'- bis (carbazol-9-yl) 9,9-dimethyl-fluorene ( DM FL-CBP), 4,4'-비스(카바졸-9-일)-9,9-비스bis(9-페닐-9H-카바졸)플루오렌 (FL-4CBP), 4,4'-비스(카바졸-9-일)-9,9-디-톨일-플루오렌 (DPFL-CBP), 9,9-비스(9-페닐-9H-카바졸)플루오렌 (FL-2CBP) 등이 사용될 수 있다. 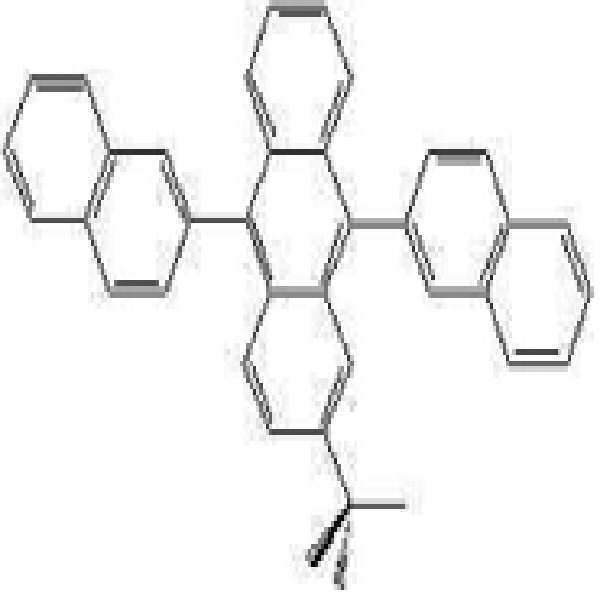 FL-CBP), 4,4'- Bis (carbazol-9-yl) 9,9-bis bis (9- phenyl -9H- carbazol) fluorene (FL-4CBP), 4,4'- bis (carbazol-9-yl) 9,9-di-tolyl-fluorene (DPFL-CBP), 9,9- bis (9-phenyl -9H- carbazol) fluorene (FL-2CBP) such as is used can. 상기 도펀트 물질로는 DPAVBi (4,4'-비스[4-(디-p-톨일아미노)스티릴]비페닐), ADN (9,10-디(나프-2-틸)안트라센), TBADN (3-터트-부틸-9,10-디(나프-2-틸)안트라센) 등이 사용될 수 있다. As the dopant material is DPAVBi (4,4'- bis [4- (di -p- tolyl-amino) styryl] biphenyl), ADN (9,10- di (naphthyl-2-naphthyl) anthracene), TBADN ( 3-tert-butyl-9,10-di-and the like can be used (naphthyl-2-naphthyl) anthracene). 이와 같이 본 발명의 제5 실시예에 관한 박막 증착 장치(100)는 호스트 물질(115)을 증착하는 제1 증착원(110)과 도펀트 물질(미도시)을 증착하는 제2 증착원(160)을 구비하여, 기판(400)상에 호스트 물질과 도펀트 물질을 동시에 증착할 수 있도록 하는 것을 일 특징으로 한다. Thus, the film deposition apparatus 100 according to the fifth embodiment of the present invention, the second deposition source 160 for depositing the first deposition source 110 and a dopant material (not shown) for depositing a host material 115, to be the one characterized in that to deposit a host material and the dopant material at the same time on the substrate 400 having the. 이와 같이 호스트 물질과 도펀트 물질을 동시에 증착하는 것이 가능해짐으로써, 공정이 더욱 간단하고 빨라지며, 소자 효율 또한 향상하는 효과를 얻을 수 있다. Thus, as becomes possible to deposit a host material and the dopant material at the same time, the process becomes simpler, faster, device efficiency can be obtained an effect of improvement. 도 10은 본 발명의 제6 실시예에 따른 박막 증착 장치를 나타내는 도면이다. 10 is a view showing a film deposition apparatus according to a sixth embodiment of the present invention. 도면을 참조하면, 본 발명의 제6 실시예에 따른 박막 증착 장치(100)는 제1 증착원(110), 제1 증착원 노즐부(120), 제2 증착원(160), 제2 증착원 노즐부(170) 및 패터닝 슬릿 시트(150)를 포함한다. Referring to the drawings, the film deposition apparatus 100 according to the sixth embodiment of the present invention comprises a first evaporation source 110, a first deposition source nozzle unit 120, a second evaporation source 160, a second deposition and a source nozzle unit 170 and the patterning slit sheet 150. 여기서, 증착원(110)(160)과 기판(400) 사이에는 패터닝 슬릿 시트(150) 및 프레임(155)이 구비되고, 패터닝 슬릿 시트(150)에는 X축 방향을 따라서 복수 개의 패터닝 슬릿(151)들이 형성된다. Here, the evaporation source 110, 160 and the substrate 400 between is provided with the patterning slit sheet 150 and the frame 155, the patterning slit sheet 150 includes a plurality of patterning slits along the X-axis direction (151 ) it is formed. 그리고, 증착원(110)(160) 및 증착원 노즐부(120)(170)와 패터닝 슬릿 시트(150)는 연결 부재(135)에 의해서 결합된다. Then, the evaporation source 110, 160 and the deposition source nozzle unit 120, 170 and the patterning slit sheet 150 is coupled by a connecting member 135. 여기서, 박막 증착 장치(100)는 호스트 물질(115)을 증착하는 제1 증착원(110)과 도펀트 물질(미도시)을 증착하는 제2 증착원(160)을 구비하여, 기판(400)상에 호스트 물질(115)과 도펀트 물질(미도시)을 동시에 증착할 수 있다. Here, the thin film deposition apparatus 100 includes a substrate 400, and a second deposition source 160 for depositing the first deposition source 110 and a dopant material (not shown) for depositing a host material 115, in the host material it can be deposited (115) and a dopant material (not shown) at the same time. 본 실시예에서는, 제1 증착원 노즐부(120)와 제2 증착원 노즐부(170)에 형성된 복수 개의 증착원 노즐(121')(171')들이 소정 각도 틸트(tilt)되어 배치된다는 점에서 전술한 제5 실시예와 구별된다. In this embodiment, the first deposition point source nozzle unit 120 and the second deposition source nozzle unit plurality of deposition source nozzles 121 '(171') formed on the (170) that are disposed with a predetermined angle of tilt (tilt) a claim is distinguished from the fifth embodiment in the above. 즉, 증착원 노즐(121')(171')들은 YZ 평면상에서 소정 각도 기울어지도록 틸트(tilt)되어 형성될 수 있다. That is, the deposition source nozzles 121 '(171 ") may be formed to tilt (tilt) tilted a predetermined angle on the YZ plane. 상세히, 도펀트의 함량은 박막 형성 재료에 따라 가변적이지만, 일반적으로 박막 형성 재료 (호스트와 도펀트의 총중량) 100 중량부를 기준으로 하여 3 내지 20 중량부인 것이 바람직하다. In detail, the content of the dopant, but is variable depending on the thin-film forming material, in general, it is preferred that a thin film-forming material (total weight of host and dopant) 100 parts by weight based on from 3 to 20 parts by weight. 만약 도펀트의 함량이 상기 범위를 벗어나면 유기 발광 소자의 발광 특성이 저하될 수 있다. If the content of dopant is outside the above range, there is a light-emitting property of the organic light emitting device may be degraded. 그런데, 상술한 제5 실시예와 같이 증착원 노즐(121')(171')들은 Z축과 평행하게 배치될 경우, 기판(400)에는 증착 초기에는 도펀트 물질이 증착되고, 증착 중반에는 도펀트 물질과 호스트 물질이 교차하여 증착되고, 증착 후반에는 호스트 물질이 증착된다. However, when the evaporation source nozzle 121 '(171') may be arranged in parallel to the Z axis, the substrate 400 is deposited initially, the dopant material is deposited and depositing the middle is the dopant material, such as the above-described fifth example and the host material is cross-deposited, the deposition is deposited, the latter, the host material. 즉, 각 영역별로 호스트 물질과 도펀트 물질의 혼합비율 차이가 균일하지 아니하게 된다. That is, the mixing ratio of the difference between the host material and the dopant material was not uniform for each region. 따라서 본 실시예에서는 증착원 노즐(121')(171')들이 소정 각도 틸트되어 배치되도록 한다. Therefore, the evaporation source nozzle 121 '(171') in the present embodiment are arranged such that the tilt a predetermined angle. 여기서, 제1 증착원 노즐부(120)의 증착원 노즐(121')들과 제2 증착원 노즐부(170)의 증착원 노즐(171')들은 서로 마주보도록 틸트될 수 있다. Here, the first deposition, deposition source nozzles (171 and the second deposition source nozzle unit 170) deposition source nozzle 121, the source nozzle unit 120 may be tilted to face each other. 즉, 제1 증착원 노즐부(120)의 증착원 노즐(121')들은 제2 증착원(170) 쪽을 바라보도록 틸트되고, 제2 증착원 노즐부(170)의 증착원 노즐(171')들은 제1 증착원(120) 쪽을 바라보도록 틸트될 수 있다. That is, the first evaporation source deposition source nozzles 121 'of the nozzle unit 120 are tilted to view at the side of the second deposition source 170, the second deposition source nozzles (171 a deposition source nozzle unit 170' ) it can be tilted to look for a first deposition source 120 side. 이와 같은 구성에 의하여, 기판 전체에 걸쳐서 호스트 물질과 도펀트 물질의 혼합비율이 균일해지는 효과를 얻을 수 있다. This is by the same configurations, the mixing ratio of the host material and the dopant material over the entire substrate can be obtained becomes uniform effect. 그리고 호스트 물질과 도펀트 물질이 균일한 비율로 함유된 혼합물로 박막층을 형성할 경우, 색 좌표, 광 효율, 구동 전압, 수명 모두의 면에서 향상된 특성을 나타낼 수 있다. And can exhibit if the host material and the dopant material to form a thin film layer with the mixture contained at a uniform rate, color coordinate, light efficiency, driving voltage, and improved characteristics in terms of both lifetime. 도 11은 본 발명의 제7 실시예에 따른 박막 증착 장치를 나타내는 도면이다. 11 is a view showing a film deposition apparatus according to a seventh embodiment of the present invention. 도면을 참조하면, 본 발명의 제7 실시예에 따른 박막 증착 장치(100)는 제1 증착원(110), 제1 증착원 노즐부(120), 제2 증착원(180), 제2 증착원 노즐(181) 및 패터닝 슬릿 시트(150)를 포함한다. Referring to the drawings, the film deposition apparatus 100 according to the seventh embodiment of the present invention comprises a first evaporation source 110, a first deposition source nozzle unit 120, a second evaporation source 180, a second deposition and a source nozzle 181 and the patterning slit sheet 150. 여기서, 증착원(110)(180)과 기판(400) 사이에는 패터닝 슬릿 시트(150) 및 프레임(155)이 구비되고, 패터닝 슬릿 시트(150)에는 X축 방향을 따라서 복수 개의 패터닝 슬릿(151)들이 형성된다. Here, the evaporation source 110, 180 and the substrate 400 between is provided with the patterning slit sheet 150 and the frame 155, the patterning slit sheet 150 includes a plurality of patterning slits along the X-axis direction (151 ) it is formed. 그리고, 증착원(110)(180) 및 증착원 노즐부(120)(181)와 패터닝 슬릿 시트(150)는 연결 부재(135)에 의해서 결합된다. Then, the evaporation source 110, 180 and the deposition source nozzle unit 120, 181 and the patterning slit sheet 150 is coupled by a connecting member 135. 여기서, 박막 증착 장치(100)는 호스트 물질(115)을 증착하는 제1 증착원(110)과 도펀트 물질(미도시)을 증착하는 제2 증착원(180)을 구비하여, 기판(400)상에 호스트 물질(115)과 도펀트 물질(미도시)을 동시에 증착할 수 있다. Here, the thin film deposition apparatus 100 includes a substrate 400, and a second deposition source 180 for depositing the first deposition source 110 and a dopant material (not shown) for depositing a host material 115, in the host material it can be deposited (115) and a dopant material (not shown) at the same time. 본 실시예에서는, 제2 증착원이 선형 소스(linear source)가 아닌 점 소스(point source)로 형성된다는 점에서 전술한 제5 실시예와 구별된다. In this embodiment, the second deposition source is distinct from the embodiment described above in that a fifth example being formed from a point source (point source) non-linear source (linear source). 상술한 바와 같이 도펀트 물질은 박막 형성 재료 (호스트와 도펀트의 총중량) 100 중량부를 기준으로 하여 3 내지 20 중량부인 것이 바람직하다. As described above, the dopant material is preferably 3 to 20 parts by weight based on 100 parts by weight of the thin film forming material (total weight of host and dopant) parts. 즉, 박막 형성 재료 중 도펀트 물질은 호스트 물질에 비하여 그 양이 상당히 적으므로, 반드시 용량이 큰 선형 소스(linear source)를 사용하여야 할 필요는 없다. That is, the dopant material of the thin-film forming material is because the amount is considerably enemy than the host material, it is not necessary to be sure to use a large linear source (linear source) capacitance. 따라서, 본 발명의 제7 실시예에 따른 박막 증착 장치는 호스트 물질을 증착하는 제1 증착원(110)은 선형 소스(linear source)로 형성되고, 도펀트 물질을 증착하는 제2 증착원(180)은 점 소스(point source)로 형성된다. Accordingly, the film deposition apparatus according to a seventh embodiment of the present invention, the second evaporation source (180) to the first evaporation source (110) depositing a host material is formed of a linear source (linear source), depositing a dopant material It is formed from a point source (point source). 여기서, 도면에는 점 소스(point source)인 제2 증착원이 하나 구비되어 있는 것으로 도시되어 있지만, 본 발명의 사상은 이에 제한되지 아니하며, 필요한 도펀트 물질의 함량에 따라 복수 개가 구비될 수도 있을 것이다. Here, the figure is shown with a point source (point source) in the second evaporation source is provided with one, but shall not features of the present invention is limited to this, it could be a plurality dogs provided in accordance with the amount of required dopant material. 이와 같이, 제2 증착원(180)을 점 소스(point source)로 구성함으로써, 박막 증착 장치의 구조가 간단해지고 제조 비용이 절감되는 효과를 얻을 수 있다. In this way, by forming the second evaporation source 180 is a point source (point source), it is possible to obtain an effect that the structure of the film deposition apparatus is simplified and manufacturing cost savings. 도 12는 본 발명의 제8 실시예에 따른 박막 증착 장치를 나타내는 도면이다. 12 is a view showing a film deposition apparatus according to an eighth embodiment of the present invention. 도면을 참조하면, 본 발명의 제8 실시예에 따른 박막 증착 장치(100)는 제1 증착원(190), 제1 증착원 노즐(191), 제2 증착원(180), 제2 증착원 노즐(181) 및 패터닝 슬릿 시트(150)를 포함한다. Referring to the drawings, the film deposition apparatus 100 according to an eighth embodiment of the present invention has a first evaporation source 190, a first deposition source nozzle 191, and the second deposition source 180, a second evaporation source and a nozzle 181 and the patterning slit sheet 150. 여기서, 증착원(180)(190)과 기판(400) 사이에는 패터닝 슬릿 시트(150) 및 프레임(155)이 구비되고, 패터닝 슬릿 시트(150)에는 X축 방향을 따라서 복수 개의 패터닝 슬릿(151)들이 형성된다. Here, the evaporation source 180, 190 and the substrate 400 between is provided with the patterning slit sheet 150 and the frame 155, the patterning slit sheet 150 includes a plurality of patterning slits along the X-axis direction (151 ) it is formed. 그리고, 증착원(180)(190) 및 증착원 노즐(181)(191)은 증착원 수용부(195) 내에 수용되고, 증착원 수용부(195)와 패터닝 슬릿 시트(150)는 연결 부재(135)에 의해서 결합될 수 있다. Then, the evaporation source 180, 190 and the deposition source nozzles 181, 191 are received in the evaporation source accommodating portion 195, the evaporation source accommodating portion 195 and the patterning slit sheet 150 includes a connecting member ( 135) can be coupled by. 여기서, 박막 증착 장치(100)는 호스트 물질을 증착하는 제1 증착원(190)과 도펀트 물질을 증착하는 제2 증착원(180)을 구비하여, 기판(400)상에 호스트 물질과 도펀트 물질을 동시에 증착할 수 있다. Here, the first deposition source 190 and the dopant the host material and the dopant material in the second evaporation source substrate 400, and having a (180) for depositing a material to deposit a thin film deposition apparatus 100 includes a host material At the same time it can be deposited. 본 실시예에서는, 제1 증착원 또한 선형 소스(linear source)가 아닌 점 소스(point source)로 형성된다는 점에서 전술한 제7 실시예와 구별된다. In the present embodiment, the first deposition source is also a distinguished from the seventh embodiment described above in that it is formed from a linear source (linear source) the point source (point source), not. 상세히, 증착원(180)(190)과 기판(400) 사이의 거리가 멀어질수록 선형 소스(linear source)가 아닌 점 소스(point source)가 증착에 유리한 경우가 있다. In detail, the distance between the evaporation source 180, 190 and the substrate 400, the more far away quality is sometimes advantageous in that the linear source (linear source), the point source (point source) is not deposited. 따라서 이 경우 호스트 물질을 증착하는 제1 증착원(190) 및 제1 증착원 노즐(191)들을 복수 개의 점 소스(point source)로 구성하되, 상기 제1 증착원(190) 및 제1 증착원 노즐(191)들을 회전 가능한 리볼버(revolver) 형태로 구성할 수 있다. Therefore, in this case, but the configuration of the first deposition source 190 and the first deposition source nozzle 191, depositing a host material of a plurality of point source (point source), the first deposition source 190 and the first evaporation source It can form the nozzles 191 in a rotatable revolver (revolver) form. 이와 같이, 제2 증착원(180)을 점 소스(point source)로 구성함으로써, 박막 증착 장치의 구조가 간단해지고 제조 비용이 절감되는 효과를 얻을 수 있다. In this way, by forming the second evaporation source 180 is a point source (point source), it is possible to obtain an effect that the structure of the film deposition apparatus is simplified and manufacturing cost savings. 도 13은 본 발명의 제9 실시예에 따른 박막 증착 장치를 나타내는 도면이다. 13 is a view showing a film deposition apparatus according to a ninth embodiment of the present invention. 도면을 참조하면, 본 발명의 제9 실시예에 따른 박막 증착 장치는 도 1 내지 도 3에서 설명한 박막 증착 장치가 복수 개 구비되는 것을 일 특징으로 한다. Referring to the drawings, the film deposition apparatus according to a ninth embodiment of the present invention is characterized in that the one film deposition apparatus described in Figures 1-3 having a plurality of. 다시 말하면, 본 발명의 일 실시예에 관한 박막 증착 장치는, 적색 발광층(R) 재료, 녹색 발광층(G) 재료, 청색 발광층(B) 재료가 한꺼번에 방사되는 멀티 증착원(multi source)을 구비하는 것을 일 특징으로 한다. In other words, the film deposition apparatus according to an embodiment of the present invention, the red light emitting layer (R) material, a green light-emitting layer (G) material, the blue light-emitting layer (B) material having a multi-evaporation source (multi source) is at the same time the radiation and an aspect that. 상세히, 본 발명의 일 실시예에 관한 박막 증착 장치는 제1 박막 증착 어셈블리(100), 제2 박막 증착 어셈블리(200) 및 제3 박막 증착 어셈블리(300)를 포함한다. In detail, the film deposition apparatus according to an embodiment of the present invention includes the first thin film deposition assembly 100, the second thin film deposition assembly 200, and a third thin film deposition assembly 300. 이와 같은 제1 박막 증착 어셈블리(100), 제2 박막 증착 어셈블리(200) 및 제3 박막 증착 어셈블리(300) 각각의 구성은 도 1 내지 도 3에서 설명한 박막 증착 장치와 동일하므로 여기서는 그 상세한 설명은 생략하도록 한다. The first thin film deposition assembly 100, the second thin film deposition assembly 200, and a third thin film deposition assembly 300, each configured like are the same as those of the thin film deposition apparatus explained in Figs Here, a detailed description thereof will be omitted. 여기서, 제1 박막 증착 어셈블리(100), 제2 박막 증착 어셈블리(200) 및 제3 박막 증착 어셈블리(300)의 증착원에는 서로 다른 증착 물질들이 구비될 수 있다. Here, the evaporation source of the first thin film deposition assembly 100, the second thin film deposition assembly 200, and a third thin film deposition assembly 300 may be each provided with other deposited material. 예를 들어, 제1 박막 증착 어셈블리(100)에는 적색 발광층(R)의 재료가 되는 증착 물질이 구비되고, 제2 박막 증착 어셈블리(200)에는 녹색 발광층(G)의 재료가 되는 증착 물질이 구비되고, 제3 박막 증착 어셈블리(300)에는 청색 발광층(B)의 재료가 되는 증착 물질이 구비될 수 있다. For example, the first thin film deposition assembly 100 is provided with a deposition material that is the material of the red light-emitting layer (R), the second thin film deposition assembly 200 is provided with a deposition material that is the material of the green light-emitting layer (G) and the third thin film deposition assembly 300 may be provided with a deposition material that is the material of the blue light-emitting layer (B). 즉, 종래의 유기 발광 디스플레이 장치의 제조 방법에서는, 각 색상별로 별도의 챔버와 마스크를 구비하는 것이 일반적이었으나, 본 발명의 일 실시예에 관한 박막 증착 장치를 이용하면, 하나의 멀티 소스로 적색 발광층(R), 녹색 발광층(G) 및 청색 발광층(B)을 한꺼번에 증착할 수 있는 것이다. That is, in the manufacturing method of the conventional organic light emitting display device, each color yieoteuna generally provided with a separate chamber and mask, by using the film deposition apparatus according to an embodiment of the present invention, the red light-emitting layer as a multi-source (R), which is a green light-emitting layer (G), and blue light-emitting layer (B) can be deposited at the same time. 따라서, 유기 발광 디스플레이 장치의 생산 시간이 획기적으로 감소하는 동시에, 구비되어야 하는 챔버 수가 감소함으로써, 설비 비용 또한 현저하게 절감되는 효과를 얻을 수 있다. Accordingly, it is possible to obtain by the production time of the organic light emitting display device is at the same time dramatically decreasing, reducing the number of chambers to be provided, equipment costs are also markedly reduced effect. 이 경우, 도면에는 자세히 도시되지 않았지만, 제1 박막 증착 어셈블리(100), 제2 박막 증착 어셈블리(200) 및 제3 박막 증착 어셈블리(300)의 패터닝 슬릿 시트(150)(250)(350)들은 서로 일정 정도 오프셋(offset)되어 배치됨으로써, 그 증착 영역이 중첩되지 아니하도록 할 수 있다. In this case, the figure, although not in detail shown, the first thin film deposition assembly 100, the second thin film deposition assembly 200 and the patterning slit sheet 150, 250, 350 of the third thin film deposition assembly 300 are by being arranged to each other to some extent offset (offset), may be so as not to be superposed is the deposition area. 다시 말하면, 제1 박막 증착 어셈블리(100)가 적색 발광층(R)의 증착을 담당하고, 제2 박막 증착 어셈블리(200)가 녹색 발광층(G)의 증착을 담당하고, 제3 박막 증착 어셈블리(300)가 청색 발광층(B)의 증착을 담당할 경우, 제1 박막 증착 어셈블리(100)의 패터닝 슬릿(151)과 제2 박막 증착 어셈블리(200)의 패터닝 슬릿(251)과 제3 박막 증착 어셈블리(300)의 패터닝 슬릿(351)이 서로 동일 선상에 위치하지 아니하도록 배치됨으로써, 기판상의 서로 다른 영역에 각각 적색 발광층(R), 녹색 발광층(G), 청색 발광층(B)이 형성되도록 할 수 있다. In other words, the first thin film deposition assembly 100 is responsible for the deposition of the red light-emitting layer (R), and the second thin film deposition assembly 200 is responsible for the deposition of the green light-emitting layer (G), and the third thin film deposition assemblies (300 ) sometimes be responsible for the deposition of the blue light-emitting layer (B), first thin film deposition assembly (patterning slits 151 and the second thin film deposition assembly 200, patterning slits 251, and the third thin film deposition assembly of 100) ( 300), the patterning slits 351 arranged so as not to position on the same line with each other, whereby each of the red light emitting layer (R), green light-emitting layer (G), blue luminescent layer (B) on different regions on the substrate may be formed . 여기서, 적색 발광층(R)의 재료가 되는 증착 물질과, 녹색 발광층(G)의 재료가 되는 증착 물질과, 청색 발광층(B)의 재료가 되는 증착 물질은 서로 기화되는 온도가 상이할 수 있으므로, 상기 제1 박막 증착 어셈블리(100)의 증착원(110)의 온도와 상기 제2 박막 증착 어셈블리(200)의 증착원(210)의 온도와 상기 제3 박막 증착 어셈블리(300)의 증착원(310)의 온도가 서로 다르도록 설정되는 것도 가능하다 할 것이다. Here, the deposition material being the material of the red light-emitting layer (R) the deposition material and the green light-emitting layer (G) depositing material, the blue light-emitting layer (B) which is a material of which the material of the so that the temperature at which the gasification each other can be different, the evaporation source (310 of the first thin film deposition assembly 100, deposition source 110, the temperature and the second thin film deposition assembly 200, deposition source 210, the temperature of the third thin film deposition assembly 300 of the ), the temperature of the would can be set to differ from each other. 한편, 도면에는 박막 증착 어셈블리가 세 개 구비되는 것으로 도시되어 있으나, 본 발명의 사상은 이에 제한되지 아니한다. On the other hand, the drawings are illustrated as being provided with three thin film deposition assemblies, and features of the present invention is not limited to this. 즉, 본 발명의 일 실시예에 관한 박막 증착 장치는 박막 증착 어셈블리를 다수 개 구비할 수 있으며, 상기 다수 개의 박막 증착 어셈블리 각각에 서로 다른 물질들을 구비할 수 있다. That is, the film deposition according to one embodiment of the invention the device may have a different material may be provided in a plurality of thin film deposition assemblies, the plurality of thin film deposition assemblies respectively. 예를 들어, 박막 증착 어셈블리를 다섯 개 구비하여, 각각의 박막 증착 어셈블리에 적색 발광층(R), 녹색 발광층(G), 청색 발광층(B) 및 적색 발광층의 보조층(R')과 녹색 발광층의 보조층(G')을 구비할 수 있다. For example, by having five thin film deposition assemblies, each of the thin film deposition assembly in the red light-emitting layer (R), green light-emitting layer (G), blue luminescent layer (B) and the auxiliary layer (R ') of the red light-emitting layer and the green luminescent layer It may be provided with an auxiliary layer (G '). 이와 같이, 복수 개의 박막 증착 어셈블리를 구비하여, 다수 개의 박막층을 한번에 형성할 수 있도록 함으로써, 제조 수율 및 증착 효율이 향상되는 효과를 얻을 수 있다. In this way, by having a plurality of thin film deposition assemblies, by providing a plurality of thin film layers can be formed at a time, it is possible to obtain the effect of the manufacturing yield and deposition efficiency are improved. 또한, 제조 공정이 간단해지고 제조 비용이 감소하는 효과를 얻을 수 있다. In addition, a manufacturing process can be simplified and an effect that the manufacturing cost decreases. 도 14에 도시된 바와 같이, 글라스재 또는 플라스틱재의 기판(50)상에 버퍼층(51)이 형성되어 있고, 이 위에 박막 트랜지스터(TFT)와, 유기 전계 발광 소자(OLED)가 형성된다. As shown in Figure 14, the glass and the buffer layer 51 on the material or plastics material substrate 50 is formed, a thin film transistor (TFT) and an organic electroluminescent device (OLED) is formed on. 기판(50)의 버퍼층(51) 상에 소정 패턴의 활성층(52)이 구비된다. The active layer 52 having a predetermined pattern is provided on the buffer layer 51 of the substrate 50. 활성층(52)의 상부에는 게이트 절연막(53)이 구비되고, 게이트 절연막(53) 상부의 소정 영역에는 게이트 전극(54)이 형성된다. The upper portion of the active layer 52 is provided with a gate insulating film 53, the gate electrode 54 is formed in a predetermined area of ​​the upper gate insulating film 53. 게이트 전극(54)은 박막 트랜지스터 온/오프 신호를 인가하는 게이트 라인(미도시)과 연결되어 있다. Gate electrode 54 is connected to the gate line (not shown) for applying a TFT on / off signal. 게이트 전극(54)의 상부로는 층간 절연막(55)이 형성되고, 컨택 홀을 통해 소스/드레인 전극(56)(57)이 각각 활성층(52)의 소스/드레인 영역(52b)(52c)에 접하도록 형성된다. A source / drain region (52b) (52c) of the gate electrode 54, source / drain electrodes 56, 57, the active layer 52, each of the upper as is the interlayer insulating film 55 is formed, through a contact hole of It is formed so as to be in contact. 소스/드레인 전극(56)(57) 상부로는 SiO 2 , SiNx 등으로 이루어진 패시베이션막(58)이 형성되고, 패시베이션막(58)의 상부에는 아크릴(acryl), 폴리 이미드(polyimide), BCB(Benzocyclobutene) 등의 유기물질로 평탄화막(59)이 형성되어 있다. A source / drain electrode 56 (57) upper portion is SiO 2, the passivation film 58 is made of such as SiNx is formed on the upper portion of the passivation film 58, an acrylic (acryl), polyimide (polyimide), BCB (Benzocyclobutene) is a planarization film 59 is formed of an organic material, such as. 평탄화막(59)의 상부에 유기 전계 발광 소자(OLED)의 애노드 전극이 되는 화소 전극(61)이 형성되고, 이를 덮도록 유기물로 화소 정의막(Pixel Define Layer: 60)이 형성된다. 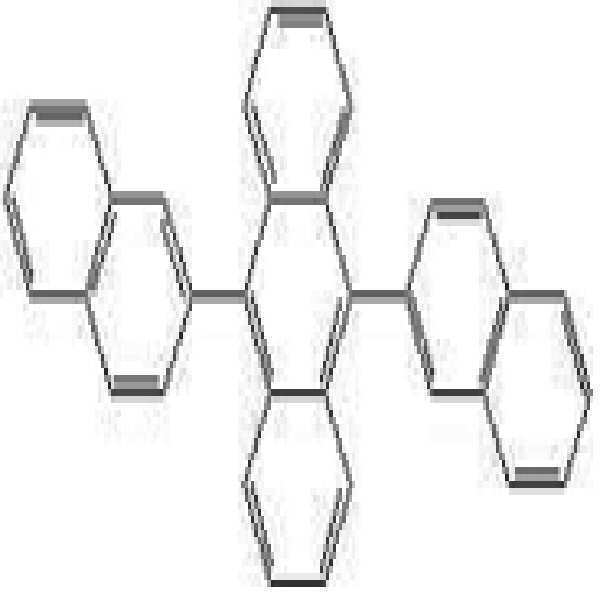 The pixel electrode 61 is the anode electrode of the flattening film 59, the organic electroluminescent device (OLED) formed on the upper portion of the pixel defining layer of organic material so as to cover them: is formed (Pixel Define Layer 60) is. 화소 정의막(60)에 소정의 개구를 형성한 후, 화소 정의막(60)의 상부 및 개구가 형성되어 외부로 노출된 화소 전극(61)의 상부에 유기막(62)을 형성한다. After a pixel defining layer 60 to form a predetermined opening, and the upper opening of the pixel defining layer 60 is formed to form the organic film 62 on the upper portion of the pixel electrode 61 exposed to the outside. 유기막(62)은 발광층을 포함한 것이 된다. The organic film 62 is not including the light emitting layer. 본 발명은 반드시 이와 같은 구조로 한정되는 것은 아니며, 다양한 유기 발광 디스플레이 장치의 구조가 그대로 적용될 수 있음은 물론이다. The invention is not limited to be this structure, that the structure of the variety of organic light-emitting display device can apply equally as well. 유기 전계 발광 소자(OLED)는 전류의 흐름에 따라 적, 녹, 청색의 빛을 발광하여 소정의 화상 정보를 표시하는 것으로, 박막 트랜지스터의 드레인 전극(56)에 연결되어 이로부터 플러스 전원을 공급받는 화소 전극(61)과, 전체 화소를 덮도록 구비되어 마이너스 전원을 공급하는 대향 전극(63), 및 이들 화소 전극(61)과 대향 전극(63)의 사이에 배치되어 발광하는 유기막(62)으로 구성된다. That the organic light emitting device (OLED) will emit light of red, green, and blue according to flow of current for displaying predetermined image information, it is coupled to the drain electrode 56 of the thin-film transistors that receive a positive power therefrom the pixel electrode 61 and the counter electrode 63, and is disposed between the organic film 62 to emit light in the pixel electrode 61 and the counter electrode 63 that is provided so as to cover the entire pixels supply a negative voltage source It consists of a. 화소 전극(61)과 대향 전극(63)은 유기막(62)에 의해 서로 절연되어 있으며, 유기막(62)에 서로 다른 극성의 전압을 가해 유기막(62)에서 발광이 이뤄지도록 한다. The pixel electrode 61 and the counter electrode 63 are isolated from each other by the organic film 62, and to apply a voltage of different polarities to the organic film 62 yirwoji light emission in the organic film 62. 유기막(62)은 저분자 또는 고분자 유기막이 사용될 수 있는 데, 저분자 유기막을 사용할 경우 홀 주입층(HIL: Hole Injection Layer), 홀 수송층(HTL: Hole Transport Layer), 발광층(EML: Emission Layer), 전자 수송층(ETL: Electron Transport Layer), 전자 주입층(EIL: Electron Injection Layer) 등이 단일 혹은 복합의 구조로 적층되어 형성될 수 있으며, 사용 가능한 유기 재료도 구리 프탈로시아닌(CuPc: copper phthalocyanine), N,N-디(나프탈렌-1-일)-N,N'-디페닐-벤지딘 (N,N'-Di(naphthalene-1-yl)-N,N'-diphenyl-benzidine: NPB) , 트리스-8-하이드록시퀴놀린 알루미늄(tris-8-hydroxyquinoline aluminum)(Alq3) 등을 비롯해 다양하게 적용 가능하다. The organic film 62 is used, which film can be used a low-molecular or polymer organic, when using membrane the low molecular weight organic hole injection layer (HIL: Hole Injection Layer), a hole transport layer (HTL: Hole Transport Layer), emitting layer (EML: Emission Layer), an electron transport layer (ETL: electron transport layer), an electron injection layer (EIL: electron injection layer), etc. can be formed are laminated in the structure of the single or multiple, of available organic materials are copper phthalocyanine (CuPc: copper phthalocyanine), N , N- di (naphthalene-1-yl) -N, N'- diphenyl-benzidine (N, N'-di (naphthalene-1-yl) -N, N'-diphenyl-benzidine: NPB), tris- various including 8-hydroxyquinoline aluminum (tris-8-hydroxyquinoline aluminum) (Alq3), etc. to be applied. 이들 저분자 유기막은 진공증착의 방법으로 형성된다. These low-molecular organic film is formed by means of vacuum deposition. 고분자 유기막의 경우에는 대개 홀 수송층(HTL) 및 발광층(EML)으로 구비된 구조를 가질 수 있으며, 이때, 홀 수송층으로 PEDOT를 사용하고, 발광층으로 PPV(Poly-Phenylenevinylene)계 및 폴리플루오렌(Polyfluorene)계 등 고분자 유기물질을 사용하며, 이를 스크린 인쇄나 잉크젯 인쇄방법 등으로 형성할 수 있다. 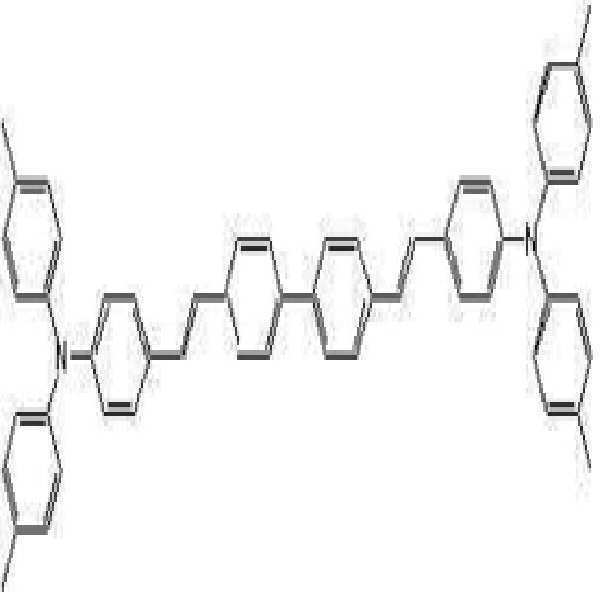 When the polymer organic layer is typically a hole transport layer (HTL) and a light-emitting layer may have a structure having a (EML), wherein, using PEDOT as a hole transport layer, and a PPV (Poly-Phenylenevinylene) based and polyfluorene (Polyfluorene emission layer ) system, etc. and a polymer organic material, it can be formed by screen printing or ink-jet printing method and the like. 이와 같은 유기막은 반드시 이에 한정되는 것은 아니고, 다양한 실시예들이 적용될 수 있음은 물론이다. The organic layer is necessarily such that it is not of course, various embodiments may be applied is not limited thereto. 화소 전극(61)은 애노드 전극의 기능을 하고, 대향 전극(63)은 캐소드 전극의 기능을 하는 데, 물론, 이들 화소 전극(61)과 대향 전극(63)의 극성은 반대로 되어도 무방하다. The pixel electrode 61 is the function of the anode electrode and the counter electrode (63) to the function of the cathode, of course, the polarity of the pixel electrode 61 and the counter electrode 63 but may be reversed. 화소 전극(61)은 투명 전극 또는 반사형 전극으로 구비될 수 있는 데, 투명전극으로 사용될 때에는 ITO, IZO, ZnO, 또는 In 2 O 3 로 구비될 수 있고, 반사형 전극으로 사용될 때에는 Ag, Mg, Al, Pt, Pd, Au, Ni, Nd, Ir, Cr, 및 이들의 화합물 등으로 반사막을 형성한 후, 그 위에 ITO, IZO, ZnO, 또는 In 2 O 3 를 형성할 수 있다. The pixel electrode 61 is used which may be provided with a transparent electrode or a reflective electrode, when used as a transparent electrode may be formed of ITO, IZO, ZnO, or In 2 O 3, when used as a reflective electrode Ag, Mg , it is possible to form the Al, Pt, Pd, Au, Ni, Nd, Ir, Cr, and after forming the reflection film in combinations thereof, such as, ITO, IZO, ZnO, or in 2 O 3 thereon. 한편, 대향 전극(63)도 투명 전극 또는 반사형 전극으로 구비될 수 있는 데, 투명전극으로 사용될 때에는 대향 전극(63)이 캐소드 전극으로 사용되므로, 일함수가 작은 금속 즉, Li, Ca, LiF/Ca, LiF/Al, Al, Ag, Mg, 및 이들의 화합물이 유기막(62)의 방향을 향하도록 증착한 후, 그 위에 ITO, IZO, ZnO, 또는 In 2 O 3 등의 투명 전극 형성용 물질로 보조 전극층이나 버스 전극 라인을 형성할 수 있다. On the other hand, the counter electrode 63 is also a transparent electrode, or so having to be provided with a reflective electrode, the counter electrode 63, when used as a transparent electrode is used as the cathode, that is a metal function is small, Li, Ca, LiF / Ca, to form a transparent electrode such as LiF / Al, Al, Ag, Mg, and combinations after the compound is deposited to face the direction of the organic film 62, the above ITO, IZO, ZnO, or in 2 O 3 for material to form an auxiliary electrode layer or a bus electrode line. 그리고, 반사형 전극으로 사용될 때에는 위 Li, Ca, LiF/Ca, LiF/Al, Al, Ag, Mg, 및 이들의 화합물을 전면 증착하여 형성한다. And, when used as a reflective electrode to form the above Li, Ca, LiF / Ca, LiF / Al, Al, Ag, Mg, and combinations thereof to the front deposit. 이와 같은 유기 발광 디스플레이 장치에서, 발광층을 포함하는 유기막(62) 등은 상술한 박막 증착 장치(도 1의 100 참조)에 의해서 형성될 수 있다. In such organic light-emitting display device, the organic film 62 such as including a light-emitting layer can be formed by (see 100 in FIG. 1) the above-described film deposition apparatus. 본 발명은 이 외에도, 유기 TFT의 유기막 또는 무기막 등의 증착에도 사용할 수 있으며, 기타, 다양한 소재의 성막 공정에 적용 가능하다. The present invention In addition to this, and can also be used for deposition of the organic TFT, such as an organic film or an inorganic film, and is applicable to other film formation process of the various materials. 상기 증착원, 상기 증착원 노즐부 및 상기 패터닝 슬릿 시트는 일체로 형성되는 것을 특징으로 하는 박막 증착 장치. The evaporation source, a thin film deposition apparatus, characterized in that the deposition source nozzle unit and the patterning slit sheet are integrally formed. 상기 증착원 및 상기 증착원 노즐부와 상기 패터닝 슬릿 시트는 연결 부재에 의해 결합되어 일체로 형성되는 것을 특징으로 하는 박막 증착 장치. The evaporation source and the film deposition apparatus, characterized in that the deposition source nozzle unit and the patterning slit sheet are coupled by a connecting member formed integrally. 상기 연결 부재는 상기 증착 물질의 이동 경로를 가이드 하는 것을 특징으로 하는 박막 증착 장치. The connecting member is a thin film deposition apparatus, characterized in that for guiding a movement path of the deposition material. 상기 연결 부재는 상기 증착원 및 상기 증착원 노즐부와 상기 패터닝 슬릿 시트 사이의 공간을 외부로부터 밀폐하도록 형성되는 것을 특징으로 하는 박막 증착 장치. The connecting member is a thin film deposition apparatus, characterized in that is formed to seal a space between the evaporation source and the deposition source nozzle unit and the patterning slit sheet from the outside. 상기 박막 증착 장치는 상기 기판과 소정 정도 이격되도록 형성되는 것을 특징으로 하는 박막 증착 장치. The film deposition apparatus is a thin film deposition apparatus being formed such that the substrate and spaced a predetermined degree. 상기 기판이 상기 박막 증착 장치에 대하여 상기 제1 방향을 따라 이동하면서, 상기 기판상에 상기 증착 물질이 연속적으로 증착되는 것을 특징으로 하는 박막 증착 장치. The substrate is a thin film deposition apparatus is characterized in that the deposited material on, the substrate moves along the first direction with respect to the film deposition apparatus to be continuously deposited. 상기 박막 증착 장치의 상기 패터닝 슬릿 시트는 상기 기판보다 작게 형성되는 것을 특징으로 하는 박막 증착 장치. The patterning slit sheet of the thin film evaporation apparatus is a thin film deposition apparatus characterized in that the smaller form than the substrate. 상기 증착원 노즐부와 상기 패터닝 슬릿 시트 사이에 배치되어 상기 증착원으로부터 방사되는 상기 증착 물질 중 적어도 일부를 차단하는 보정판을 더 포함하는 박막 증착 장치. Is disposed between the deposition source nozzle unit and the patterning slit sheet film deposition apparatus further comprises a correction plate for blocking at least a portion of the deposition material radiated from the evaporation source. 상기 보정판은 증착되는 박막의 두께가 실질적으로 동일하게 형성되도록 구비되는 것을 특징으로 하는 박막 증착 장치. The compensator film deposition apparatus, characterized in that provided that the thickness of the thin film to be deposited substantially identically formed. 상기 보정판은 상기 패터닝 슬릿 시트의 중심에서 멀어질수록 높이가 낮게 형성되는 것을 특징으로 하는 박막 증착 장치. The compensator film deposition apparatus characterized in that the more distant to be low in height formed at the center of the patterning slit sheet. 상기 보정판은 원호 또는 코사인 곡선의 형상으로 형성되는 것을 특징으로 하는 박막 증착 장치. The compensator film deposition apparatus characterized in that formed in the shape of a circular arc or a cosine curve. 상기 보정판은 상기 패터닝 슬릿 시트의 중심에서의 상기 증착 물질의 차단량이 상기 패터닝 슬릿 시트의 단부에서의 상기 증착 물질의 차단량보다 많도록 형성되는 것을 특징으로 하는 박막 증착 장치. The compensator film deposition apparatus, characterized in that the amount of blocking of the deposition material at the center of the patterning slit sheet is formed to greater than the off rate of the deposited material at the ends of the patterning slit sheet. 상기 복수 개의 패터닝 슬릿들은 서로 상이한 길이를 갖도록 형성되는 것을 특징으로 하는 박막 증착 장치. The film deposition apparatus being formed to have a plurality of patterning slits have different lengths from each other. 상기 복수 개의 패터닝 슬릿들은 증착되는 박막의 두께가 실질적으로 동일하게 형성되도록 구비되는 것을 특징으로 하는 박막 증착 장치. The film deposition apparatus, characterized in that the thickness of the thin film in which the plurality of patterning slits are provided such that the deposition to form substantially the same as. 상기 각 패터닝 슬릿들의 길이에 의하여, 상기 기판상에 증착되는 증착 물질의 증착량이 제어되는 것을 특징으로 하는 박막 증착 장치. By the length of each of the patterning slits, the film deposition apparatus characterized in that the amount of deposition of the deposition material deposited on the substrate control. 상기 패터닝 슬릿 시트의 중심 부분의 상기 패터닝 슬릿의 길이가 상기 패터닝 슬릿 시트의 양단부의 상기 패터닝 슬릿의 길이보다 짧게 형성되는 것을 특징으로 하는 박막 증착 장치. The film deposition apparatus, characterized in that the length of the patterning slits in the center portion of the patterning slit sheet is formed shorter than the length of the patterning slits in both end portions of the patterning slit sheet. 상기 복수 개의 증착원 노즐들은 소정 각도 틸트 되도록 형성되는 것을 특징으로 하는 박막 증착 장치. The plurality of deposition source nozzles film deposition apparatus, characterized in that formed such that the predetermined tilt angle. 상기 복수 개의 증착원 노즐들은 상기 제1 방향을 따라 형성된 두 열(列)의 증착원 노즐들을 포함하며, 상기 두 열(列)의 증착원 노즐들은 서로 마주보는 방향으로 틸트되어 있는 것을 특징으로 하는 박막 증착 장치. The plurality of deposition source nozzles comprise a deposition source nozzles in the two columns (列) formed along the first direction, the two deposition source nozzles in the column (列) are characterized in that which is tilted toward each other the film deposition apparatus. 상기 두 열(列)의 증착원 노즐들 중 제2 측에 배치된 증착원 노즐들은 패터닝 슬릿 시트의 제1 측 단부를 바라보도록 배치되는 것을 특징으로 하는 박막 증착 장치. Wherein the two evaporation source nozzles arranged in a second side of the deposition source nozzles in the column (列) are thin film deposition apparatus is arranged to look for a first-side end portion of the patterning slit sheet. 상기 증착원은, 호스트 물질을 방사하는 제1 증착원과, 상기 제1 증착원의 일 측에 배치되며, 도펀트 물질을 방사하는 제2 증착원을 포함하는 것을 특징으로 하는 박막 증착 장치. The evaporation source is, and the first evaporation source for emitting host material, is disposed to one side of the first evaporation source, a thin film deposition apparatus characterized in that it comprises a second evaporation source for emitting dopant material. 상기 제1 증착원에서 방사되는 상기 호스트 물질의 적어도 일부와 상기 제2 증착원에서 방사되는 상기 도펀트 물질의 적어도 일부가 혼합되는 것을 특징으로 하는 박막 증착 장치. The film deposition apparatus, characterized in that at least a portion of the host material to be emitted from the first evaporation source wherein that at least a portion of the dopant material to be emitted from the second evaporation source in combination. 상기 제1 증착원과 상기 제2 증착원은 상기 제1 방향을 따라 나란하게 배치되는 것을 특징으로 하는 박막 증착 장치. The first deposition source and the second deposition source is a thin film deposition apparatus characterized in that the side-by-side arrangement along the first direction. 상기 증착원 노즐부는, 상기 제1 증착원의 일 측에 배치되며 상기 제1 방향을 따라 복수 개의 증착원 노즐들이 형성되는 제1 증착원 노즐부와, 상기 제2 증착원의 일 측에 배치되며 상기 제1 방향을 따라 복수 개의 증착원 노즐들이 형성되는 제2 증착원 노즐부를 포함하는 것을 특징으로 하는 박막 증착 장치. And the deposition source nozzle unit, the first deposition is arranged on one side of the circle wherein the first deposition is to a plurality of deposition source nozzles formed along the first direction source nozzle unit, it is arranged on one side of the second evaporation source the film deposition apparatus characterized in that it comprises a second evaporation source nozzle with a plurality of deposition source nozzles formed along the first direction. 상기 제1 증착원 노즐부 및 상기 제2 증착원 노즐부 각각의 복수 개의 증착원 노즐들은 소정 각도 틸트 되도록 형성되는 것을 특징으로 하는 박막 증착 장치. The first deposition source nozzle unit and the second deposition source nozzle unit, each of the plurality of deposition source nozzles film deposition apparatus, characterized in that formed such that the predetermined tilt angle. 상기 제1 증착원 노즐부의 증착원 노즐들과 상기 제2 증착원 노즐부의 증착원 노즐들은 서로 마주보는 방향으로 틸트되어 있는 것을 특징으로 하는 박막 증착 장치. The film deposition apparatus, characterized in that it is tilted in the first direction of the evaporation source nozzle and the evaporation source nozzle unit wherein the deposition source nozzle unit 2 deposition source nozzles are facing each other. 상기 제1 증착원 노즐부의 증착원 노즐들과 상기 제2 증착원 노즐부의 증착원 노즐들은 상기 기판 전체에 걸쳐서 상기 호스트 물질과 상기 도펀트 물질의 혼합비율이 균일해지도록 틸트되어 있는 것을 특징으로 하는 박막 증착 장치. The first deposition source nozzle unit deposition source nozzles and the second vapor deposition source nozzle unit circle nozzles are thin film, characterized in that over the entire substrate is tilted so that the mixing ratio of the host material and the dopant material uniformly deposition apparatus. 상기 제1 증착원과 상기 제2 증착원은 각각 선형 소스(linear source)로 형성되는 것을 특징으로 하는 박막 증착 장치. The film deposition apparatus, characterized in that formed in the first deposition source and the second deposition source is a linear source (linear source), respectively. 상기 제1 증착원은 선형 소스(linear source)로 형성되고, 상기 제2 증착원은 하나 이상의 점 소스(point source)로 형성되는 것을 특징으로 하는 박막 증착 장치. The first deposition source is a thin film deposition apparatus, characterized in that is formed of a linear source is formed from a (linear source), and the second evaporation source is at least one point source (point source). 상기 제1 증착원을 구성하는 복수 개의 점 소스(point source)들은 회전 가능한 리볼버(revolver) 형태로 형성되는 것을 특징으로 하는 박막 증착 장치. The film deposition apparatus, characterized in that the first deposition a plurality of point source (point source) that make up the original are formed by a rotatable revolver (revolver) form. 상기 박막 증착 장치는 상기 증착원, 상기 증착원 노즐부 및 상기 패터닝 슬릿 시트로 구성된 박막 증착 어셈블리를 복수 개 구비하는 것을 특징으로 하는 박막 증착 장치. The film deposition apparatus is a thin film deposition apparatus comprising a plurality of the thin film deposition assembly consisting of the evaporation source, the deposition source nozzle unit and the patterning slit sheet. 상기 기판이 상기 박막 증착 장치에 대하여 상기 제1 방향을 따라 이동하면서 증착이 수행되는 것을 특징으로 하는 박막 증착 장치. The film deposition apparatus, characterized in that the substrate is vapor deposition is performed while moving along the first direction with respect to the film deposition apparatus. 상기 각각의 박막 증착 어셈블리의 상기 증착원, 상기 증착원 노즐부 및 상기 패터닝 슬릿 시트는 일체로 형성되는 것을 특징으로 하는 박막 증착 장치. The film deposition apparatus, characterized in that the each of the evaporation sources of the thin film deposition assemblies, and the deposition source nozzle unit and the patterning slit sheet are integrally formed. 상기 각각의 박막 증착 어셈블리의 상기 증착원 및 상기 증착원 노즐부와 상기 패터닝 슬릿 시트는 연결 부재에 의해 결합되어 일체로 형성되는 것을 특징으로 하는 박막 증착 장치. The film deposition apparatus, characterized in that of each of the thin film deposition assembly, the evaporation source and the deposition source nozzle unit and the patterning slit sheet are coupled by a connecting member formed integrally. 상기 각각의 박막 증착 어셈블리의 상기 패터닝 슬릿 시트는 상기 기판보다 작게 형성되는 것을 특징으로 하는 박막 증착 장치. The patterning slit sheet of each of the thin film deposition assemblies are film deposition apparatus characterized in that the smaller form than the substrate. 상기 복수 개의 박막 증착 어셈블리들의 각 증착원에는 별개의 증착 물질들이 각각 구비되는 것을 특징으로 하는 박막 증착 장치. In the film deposition apparatus, it characterized in that a separate deposition material are provided, respectively, each evaporation source of the plurality of thin film deposition assemblies. 상기 복수 개의 박막 증착 어셈블리들의 각 증착원에 구비된 각 증착 물질들이 동시에 상기 기판상에 증착되는 것을 특징으로 하는 박막 증착 장치. The film deposition apparatus characterized in that each of the evaporation material that is provided on each of the evaporation source of the plurality of thin film deposition assemblies are simultaneously deposited on the substrate. 상기 박막 증착 어셈블리들은 적어도 세 개가 구비되며, 상기 적어도 세 개의 박막 증착 어셈블리들의 각 증착원에 구비되는 증착 물질은 각각, 적색 발광층 재료, 녹색 발광층 재료 및 청색 발광층 재료인 것을 특징으로 하는 박막 증착 장치. The thin film deposition assembly may be provided with at least three, at least the deposition material which is provided for each evaporation source of the three thin film deposition assemblies, the film deposition apparatus, characterized in that each of red light emitting materials, green light emitting material and the blue light emitting layer material. 상기 복수 개의 박막 증착 어셈블리들의 각 증착원들은, 각 증착원 별로 증착 온도가 제어 가능하도록 구비되는 것을 특징으로 하는 박막 증착 장치. The film deposition apparatus, characterized in that provided for each evaporation source are the deposition temperature for each evaporation source of the plurality of thin film deposition assemblies to be controlled. 상기 복수 개의 박막 증착 어셈블리들의 각 증착원들은, 각 증착원 별로 증착량의 제어가 가능하도록 구비되는 것을 특징으로 하는 박막 증착 장치. The film deposition apparatus being provided with a control of the plurality of thin film deposition assemblies, each of the evaporation source, the deposition source for each vapor deposition amount is possible.